Slightly delayed post on account of ImgBB being down yesterday evening. 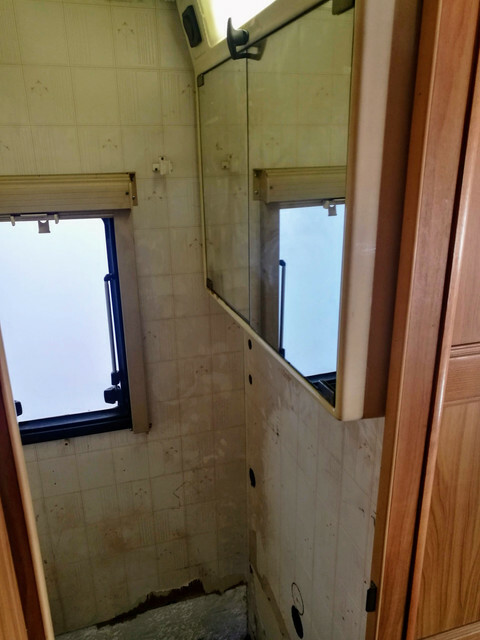 Yesterday afternoon I had a bit of a push to get the bathroom work finished, and am glad to report that save for needing to refit the curtain rail and source a shower curtain, the bathroom is now done. Oh...and find some brown screw caps as the white ones stick out way too much against the generally warm coloured decor. Doesn't look too bad for an entirely home brew job though I reckon? Here's a couple of before and after pictures. 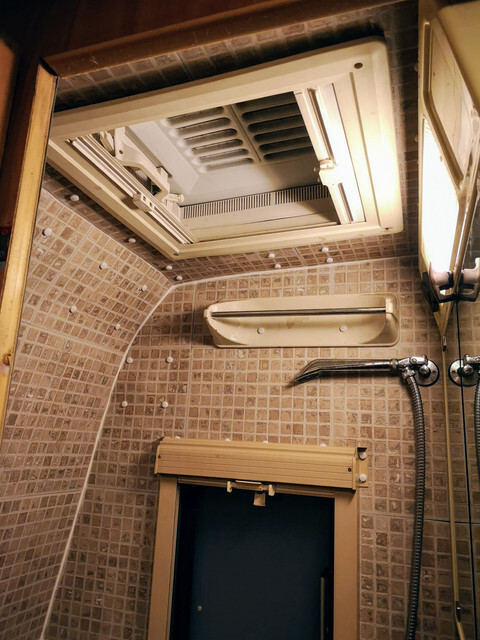 Just need to make a blanking plate to sit in the shower tray when it's not in use, re-fit the rail for the shower curtain and we should be done. Oh, and stick some water in the tank so I can confirm the taps don't leak before discovering that's an issue at the far end of the country. All these photos remind me every time how I've fallen behind with my remodeling and the photographing thereof. But in other news, I was out and about a bit yesterday after my wife and I had finished with some medical appointments and I think I may have a ring to build around a 27.55 carat ruby I've had for a while. At 18mm x 13mm x 9mm, emerald cut, it's quite an impressive stone, and on the large side for a ring. Quite gaudy, to say the least, but beautiful if you like big rocks on your fingers. My wife has an oval cut 17.7 carat sapphire in a ring I made for her, and wears it quite often. Like, she wears it more often than not. Yesterday she had it on and showed it to a woman who liked it. I told her I have another sapphire almost identical, only 15.5 carat, then the ruby. Turns out that she's even more nuts about rubies than me, and is really interested in that big stone in a ring similar to my wife's. I get almost all my stones direct from India, where about 90% of the world sends raw stones to be cut and polished. Makes for tremendous savings. But there are a few problems, as well. Main one is time. Takes a while to ship one to me. But not as long as dealing with shipping anything from China. Another is authenticity. For instance, these stones ( the sapphires and two rubies) are supposed to be natural, earth-mined stones. I had a jeweler friend test them, and they tested harder than earth-mined stones usually do. He said that indicates that they might be lab-created. This of course lowers the value. How much? you ask..... well, okay, you didn't ask, but anyway.... Earth mined sapphires and rubies of this quality ( they're the same mineral) would cost in the neighborhood of about $1200 a carat. Lab created, about $750 a carat. That means that the 27.7 carat ruby might only be worth $20,775 if a lab stone instead of $33,240. Oh well. Anyone interested in a custom made, 14K gold filled wire-wrapped ring with a 15.5 carat sapphire for $100 plus shipping? Because if you consider what the stone is worth at the cheapest versus what I paid for it, I didn't steal the stone, I stole it! Photos of my wife's ring are on my Facebook page, Made in the shade Jewelry & Things along with examples of the other "Things" I make. 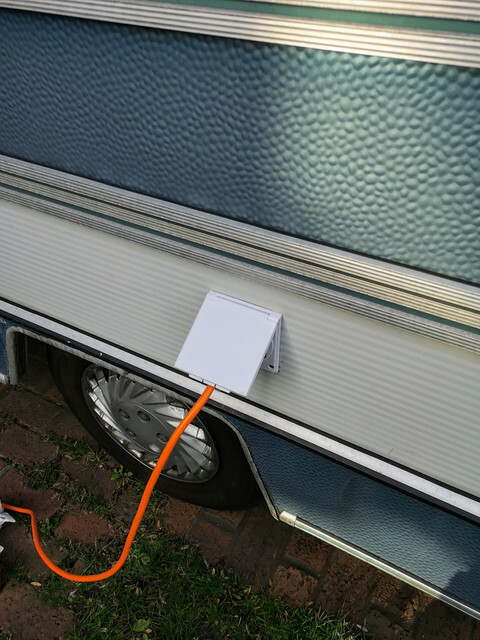 Hardly any time to look at the cars today, so was just able to get a little bit of system testing done on the van. Threw some water in the fresh water tank and set the pump running. 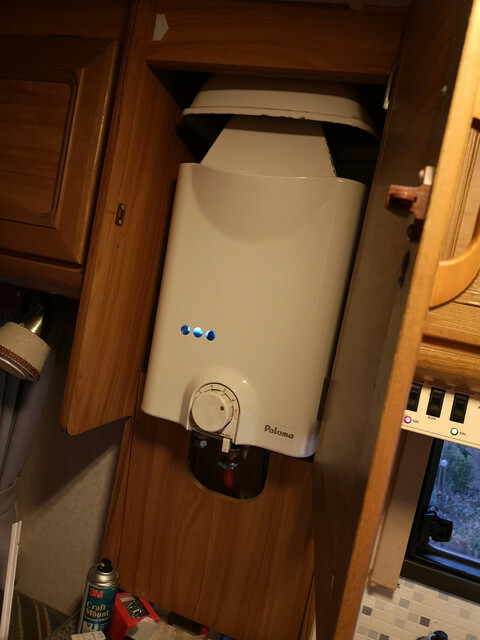 The odd arrangement at the base of the tap is my temporary solution to the problem presented by the emphatically not camper/caravan grade worktop being thicker than the threaded section of the tap is long. The worktop will be getting binned for something more appropriate as soon as I get around to sourcing something suitable. See also my previous comments about whoever started to "upgrade" this van having zero concept of the idea that unnecessary weight isn't your friend. Bathroom sink had water through soon enough as well, taps work properly and don't leak which is nice - even though I do have a spare if there turned out to be any issues with the bodies. 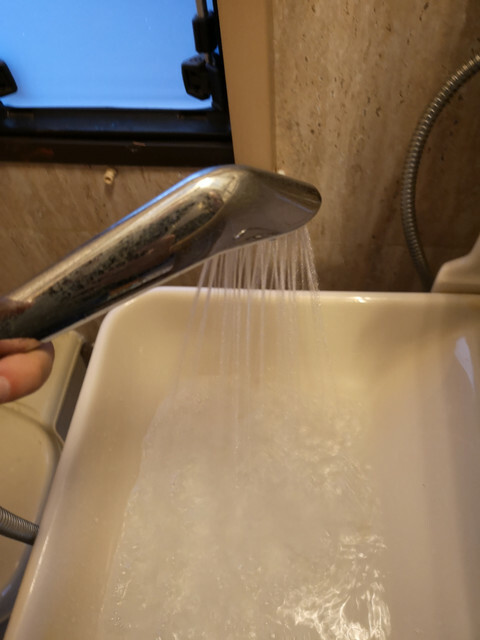 One thing I was curious to see was whether it would be possible to actually get a useful amount of flow from the shower at an acceptably high temperature for it to actually be useful. The water heater I have always eyed with slight suspicion given the fact that it did a good impression of a fountain the first time that I supplied water to it due to perished O-rings in several locations. Thankfully my replacements seem to be holding up just fine, and aside from making unreasonably loud gurgling noises for the first few seconds, it behaved. Yes, I did remember to close the drain down valve before turning the pump on. 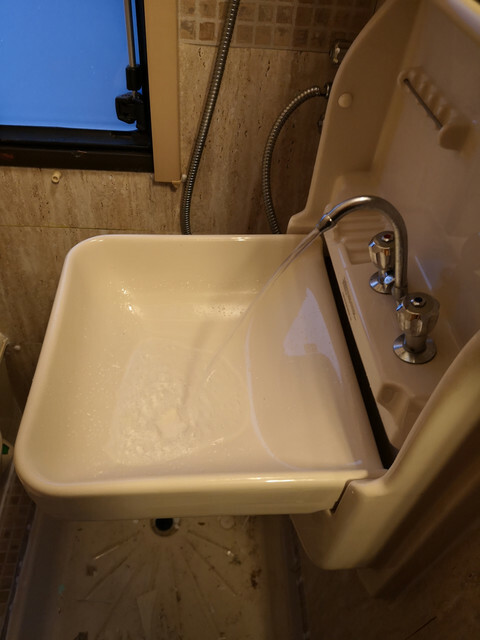 Once switched on, it fired up as soon as the hot water tap was turned on, just as it should. I don't have a combustion tester, but the flame looks healthy to me. Adjusting the shower controls to giving what feels a sensible temperature seems to be at a flow rate that's on par with any electrically heated shower I've used before. Not a power shower that's going to knock you over when you turn it on, but it's absolutely fine for taking a quick shower and to wash your hair with. So I'm calling it done on the bathroom and plumbing in general for a bit. 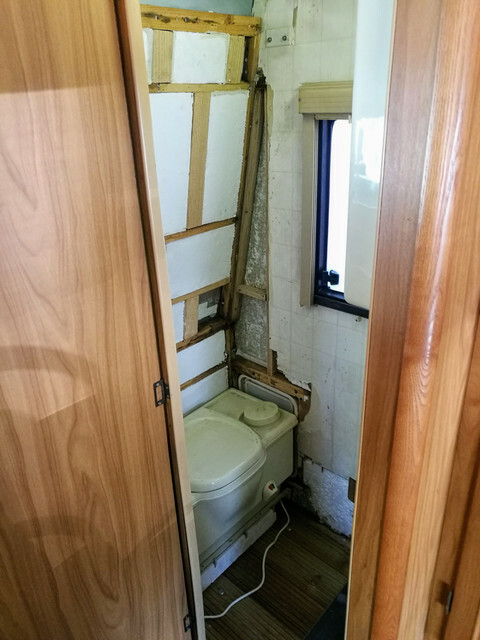 I still need to fit a shower curtain, finish off a few bits of silicone sealant and to fit a few pipe clips in the utility cupboard, but that's all just simple stuff. Next main target is going to be the kitchen. Rip out those poorly fitted household worktops (they're not even close to level for one thing) and install something that weighs less than a Mini. Reconstruct the partitions below the worktops, including the gas cabinet and the support framework for the drawers. 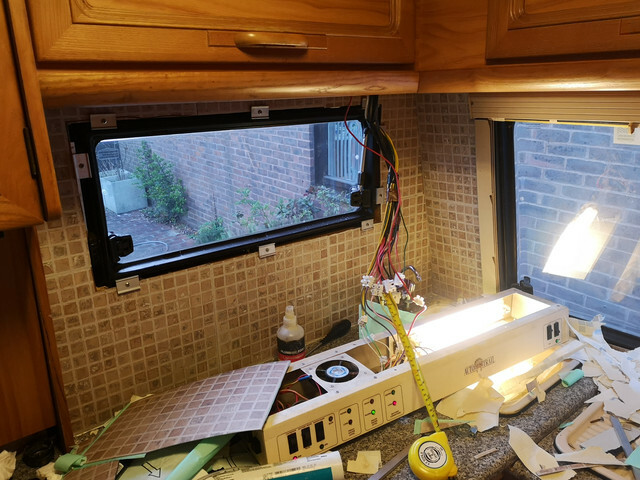 Replace the crudely hacked off gas pipework to the oven and cabin heater. Really wish they had disconnected stuff rather than just snip the pipes off with a pair of side cutters. 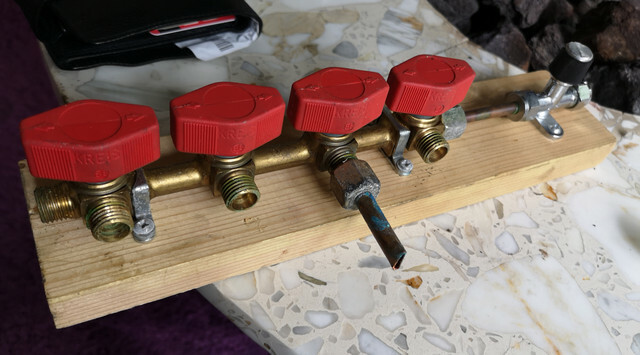 Need to confirm for definite if the manifold I have is a long obsolete size for with it's hard to get fittings for or not, and if so just buy a new one. If not, pick up the missing fittings so I can connect stuff up properly. 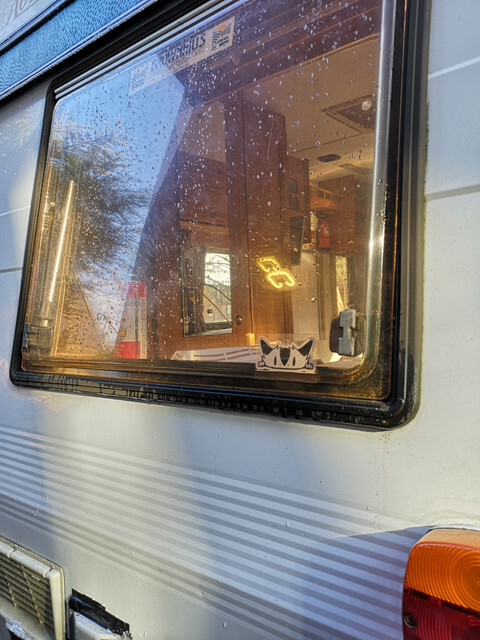 I'm very, very aware that the current setup is absolutely NOT getting used beyond the one weekend away - and even then the gas was only on when we actively needed the oven or hot water. Properly reattach the heat shielding around the oven - I'm absolutely certain that my current configuration isn't right as none of the holes in it line up properly. 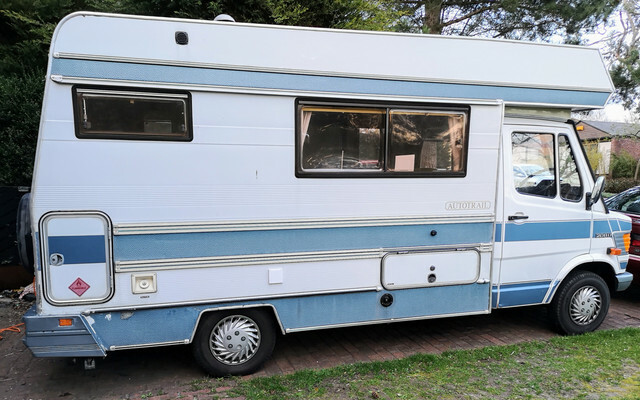 This is one of those situations where it would be really useful to be able to have a look at one of these vans in standard form so I could see how it was originally put together. Once all of this is done, obviously re-route the plumbing as necessary. At least being flexible lines that's hardly an issue. Finally, sort out the peeling wallpaper around that general area. 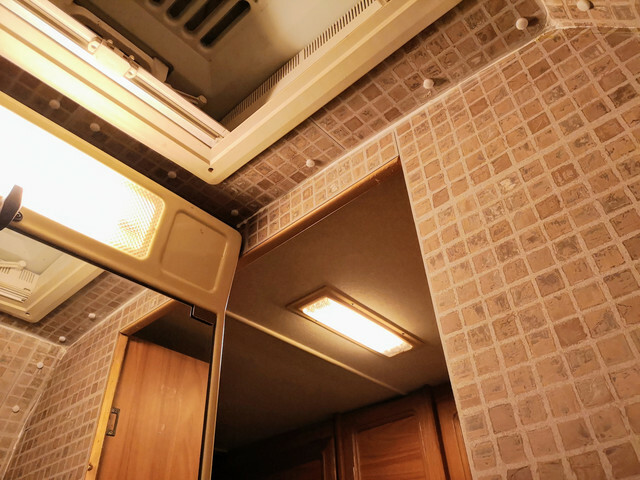 I've pretty much decided at this point that the brown mosaic pattern from the bathroom will be continued around the rear window and across the worktop splash back, finishing where the cabinet for the water heater is. It should help make things look more seamless and professional I think, and be a lot easier to keep clean around the kitchen than the wallpaper. 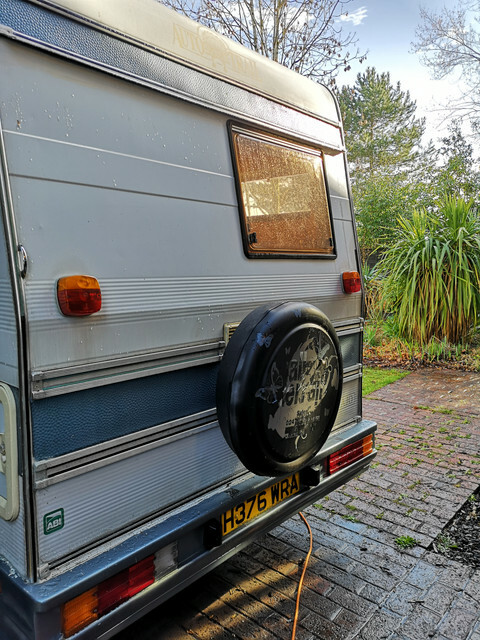 We're booked in for a weekend away in May - so that's my deadline to get the thing MOT'd and the kitchen into a serviceable state. 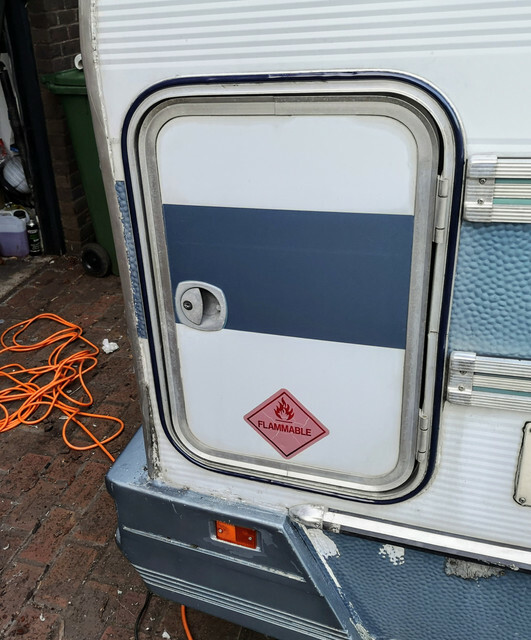 The offside rear corner is the only place on the van I've had any signs of active water ingress. As is standard for a van like this (or a coach), trying to actually match up where the rain is getting in with where it is appearing is tricky. There was no sign of dampness anywhere above the height of the worktop (the wallpaper is peeling more because it hasn't been applied properly than due to damp. As such my guess was that it was finding a point of entry below the height of the work surface but above the floor. There is a bodywork join there and as such that has to be a favourite. No obvious issues present there other than that the infill strips were all missing. 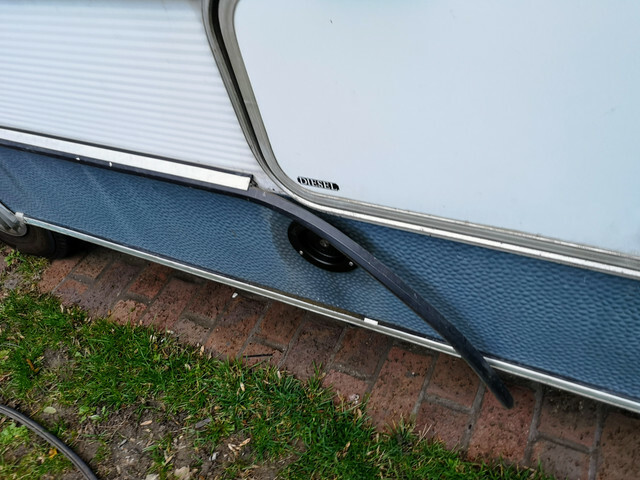 This could be to blame, especially bearing in mind that due to the slope of our driveway about 90% of all water coming off the roof of the van pours down that corner at the back. ...So no reason not to get it and the missing end caps (which meant open screw holes!) back in place. Should be a nice quick job for the afternoon, right? This is the point at which I discovered something really rather annoying. 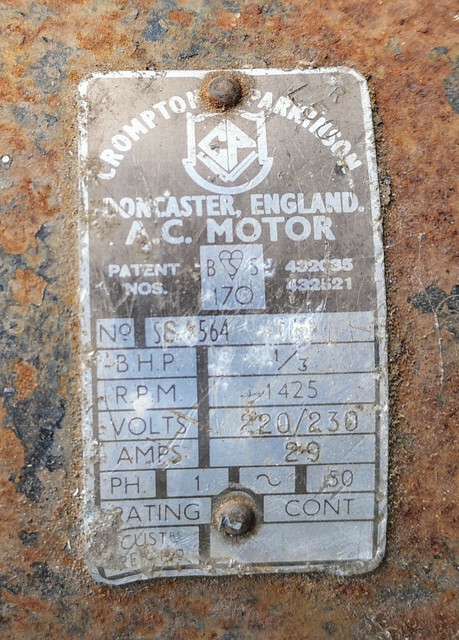 When whoever it was last had these strips off, they refitted them with screws rather than the original staples. Fair enough, I would have done the same. The issue however is that what they had not done was countersink the holes in the aluminium trim. The result of this being the screws sitting just proud of the surface enough to prevent me from fitting the infill strip. Cue me having to remove each screw, drill the hole out slightly and refit it. For Every...single...screw. We got there in the end though - after several hours. The only bit I still need to do here is the nearside corner, though I need to dig the old silicone out of the groove there first. 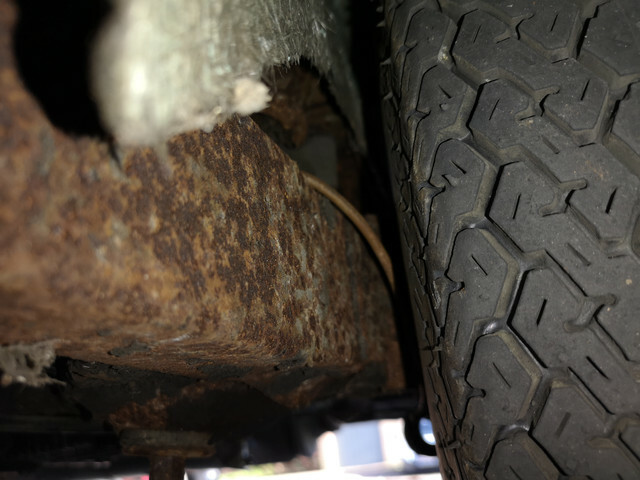 Oh...and the spare wheel retaining bolt has been greased...I had to use an uncomfortably large amount of force to remove it given the lack of structural metalwork that the carrier is attached to. Hopefully having got a bit more sealant involved and having replaced all the infill that corner will stay dry now...guess we will see next time it rains. 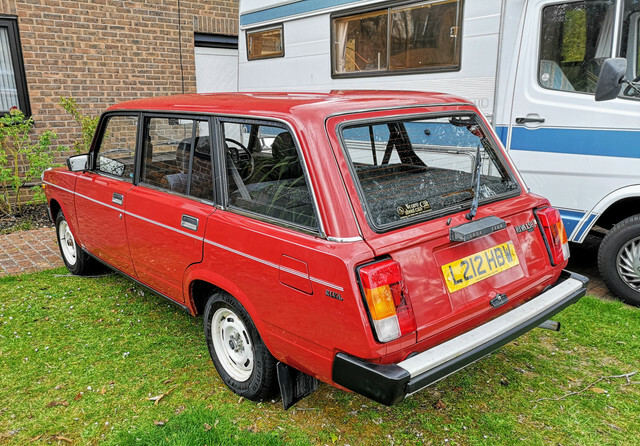 The things obviously missing from the bodywork there are two high level tail lights which AutoTrail fitted to all their vans in this era. 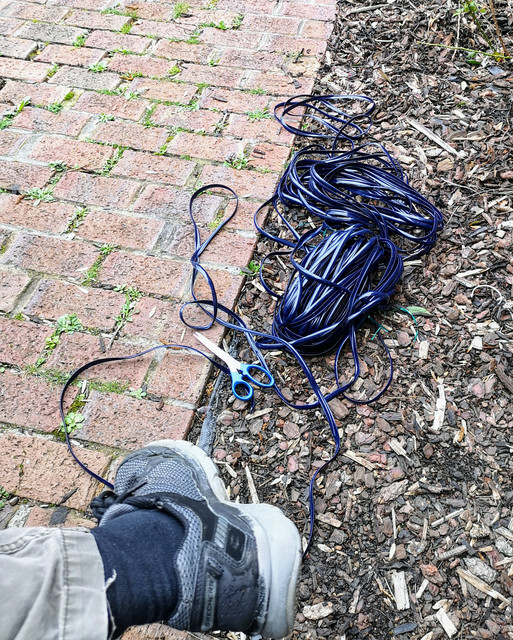 I would quite like to get them reinstated, though as all of the wiring has been removed it will be a bit of a chore...it will happen at some point, just might not be this week. Didn't have any time for car stuff today really, but did manage to spend fifteen minutes refitting the two main side rubbing strips. Thankfully unlike the smaller infill ones this didn't involve re-drilling three thousand holes, just slipped straight in. I stuffed a good blob of non-setting seam sealer under the end caps so there's no chance of water getting into the panel through the screw holes. 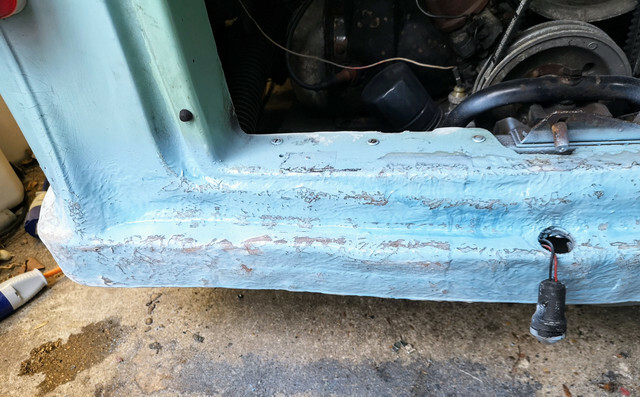 The nearside rubbing strip really will need to come off to redo the whole lot as the sealant under it is an absolute mess and it looks horrible. What was a bag full of bits when I got the van has now been reduced to this. The white circular thing is the cover for the keyhole on the toilet access door. 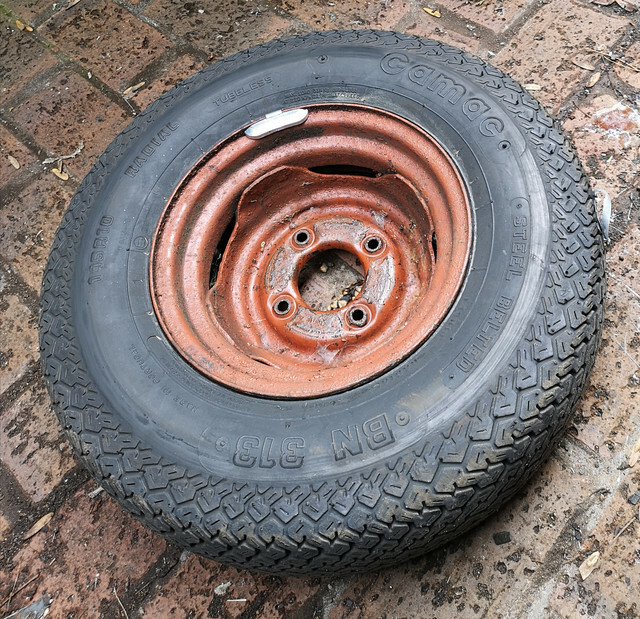 The last four metal bits are for the lower strip behind the rear wheels. Those will need the screw holes re-drilled before I can refit the infill though. 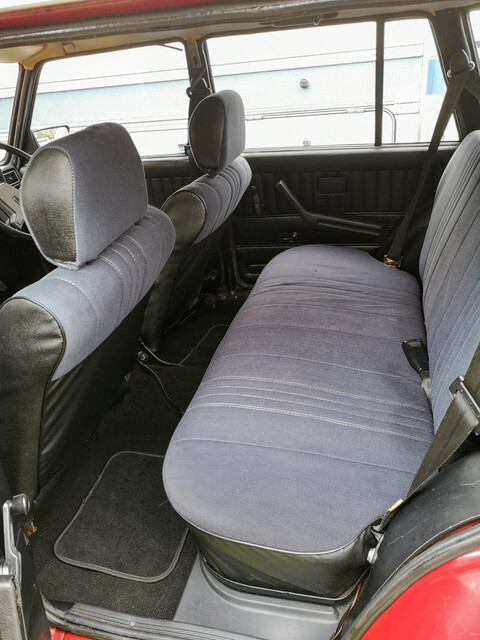 Aside from the obvious impact on helping keep the van weather tight, I'm glad to be getting stuff like this done as I always like to turn up for an MOT in a vehicle that even if old looks to be well looked after. 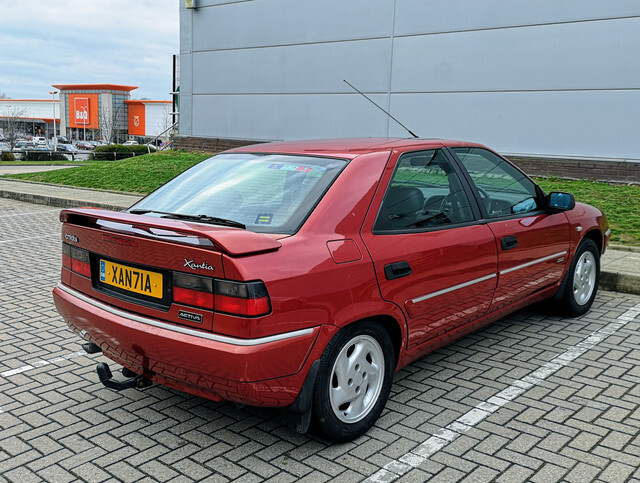 Speaking of a car looking well looked after...I was feeling really guilty about the state the poor Xantia was in, so finally dropped by one of our local hand car washes and got it a mini valet. Looking a bit more respectable now at least. One of the things I always tended to do my best to avoid when helping out with preserved buses was the fiddly bits of bodywork...oily bits I'm good with, but the bodywork is something which I always find it takes a massive amount of time for little visible gain. However with it being my own vehicle that's less of an option as I can't delegate it to the new guy! So it is a day of "annoying fiddly bits." First up, the last two bits of infill that were missing. That whole lower panel skin is in pretty poor state with quite a few tiny holes in, so I may need to think about changing it at some point. For now I've just touched them in with seam sealer to keep the elements out. That was the nice easy bit done. 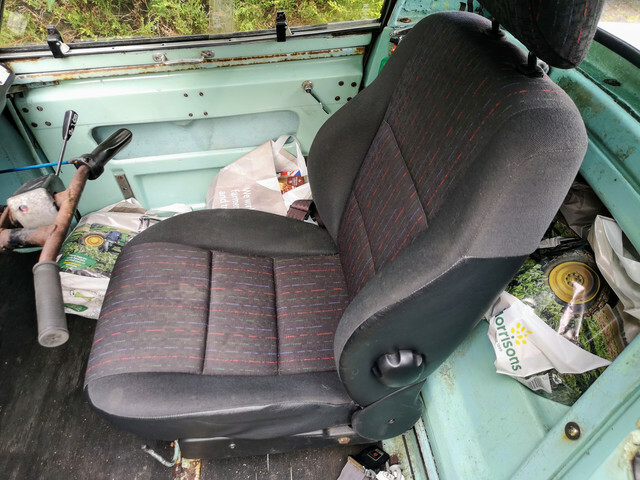 Just wanted those done first as it meant that I could get rid of another bag from the box of bits of van as all the trim is now actually attached to it again. 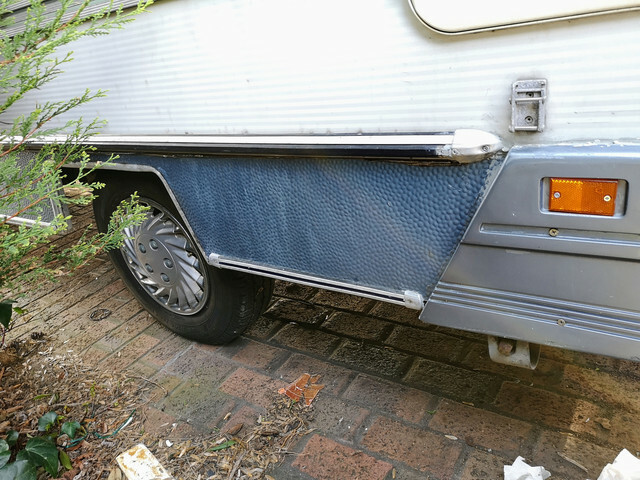 Next up was replacing the missing upright infill from the nearside rear corner. As this runs all the way to the front of the van, I'm not doing it all right now. Just the last couple of feet. However before I could do that I first needed to dig the silicone sealant out of the channel. This must have taken me the best part of an hour. Turns out that it sticks really quite well to tarnished old aluminium. Eventually though I managed to clear enough of it out of the channel that it was possible to get the strip in. 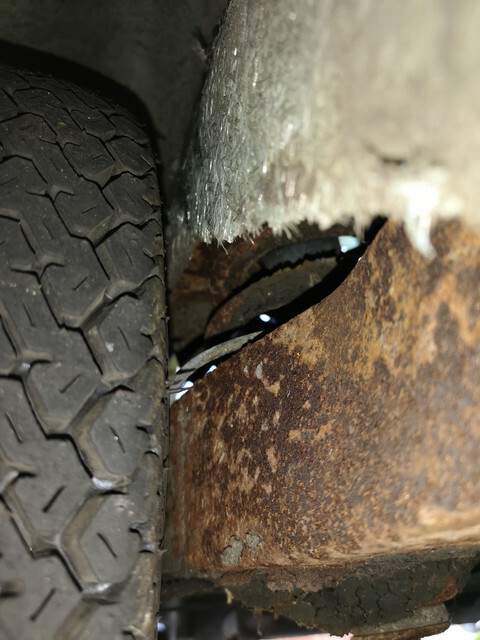 The strip directly above the passenger door on the cab I noticed a couple of days ago had come away from the cab and was just barely hanging on by a couple of threads on two screws. Was a quick matter to pull that off, clean it up, stick a new mastic strip to the back of it and slap it back in place. I used slightly larger screws to help take up the slack and then put a new infill in there. Getting the infill in was a bit of a chore purely because it was done teetering on the door step. Funny how jobs like this make you appreciate how much bigger the thing is than a car. This had been on my radar since the day I bought the van. 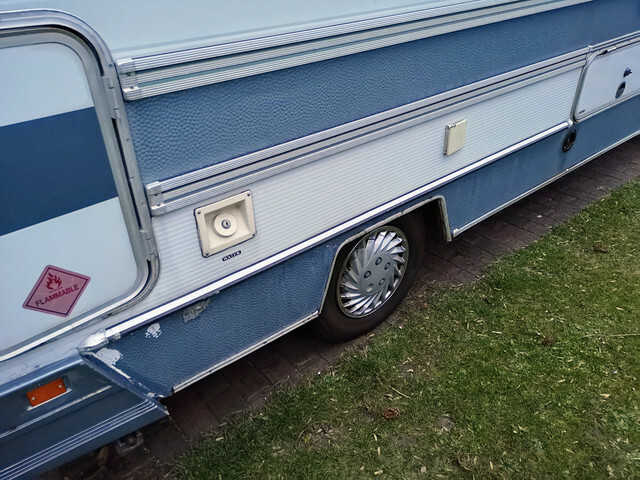 In fact I bought a new hookup unit about a week into owning it... replacement of this definitely needed to happen, as aside from just looking awful it also insistently would flap around going click-click-click-click-click-click anywhere north of 40mph. Much better. It actually latches closed as well so hopefully won't drive me demented next time I'm on the open road. This was the point at which I spotted two (blindingly obvious afterwards!) bits of infill I had missed. These were on the surround of the gas locker and luggage compartment doors. You can see how it just fits into a groove around the edge here. Now this was a task which I went into thinking it would be a ten minute thing to finish the day off with. Yeeeeaahh...About an hour later I had both doors done. One of those jobs that is just incredibly fiddly and time consuming. Does help make the van tidier though as a whole bunch less screws heads are on show how. 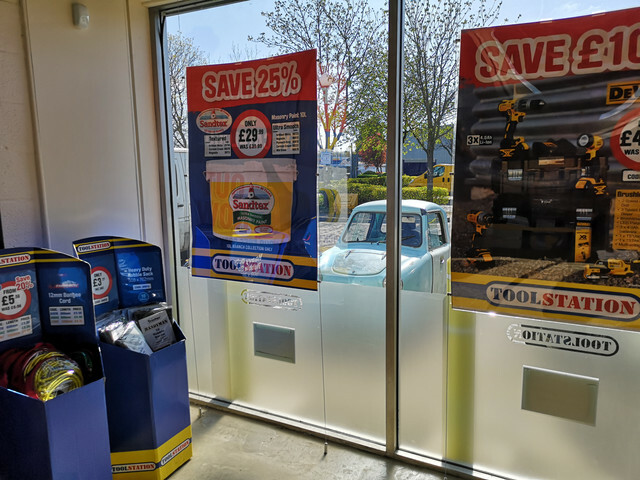 Really do need to get some decent wheel trims though and bin the bargain bin specials currently on there as it drags the whole thing down. It's coming along really nicely, well done. And I love the custom number plate on the Xantia! 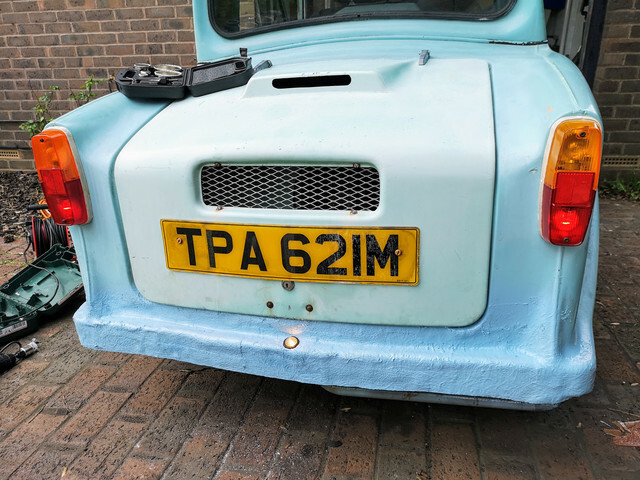 It does seem to get noticed - have had several people who refused to believe that it wasn't in fact a show plate and is the registration actually attached to the car. Having ignored the Invacar for the last couple of weeks while I distracted myself playing with the van, it's time I got back on track. 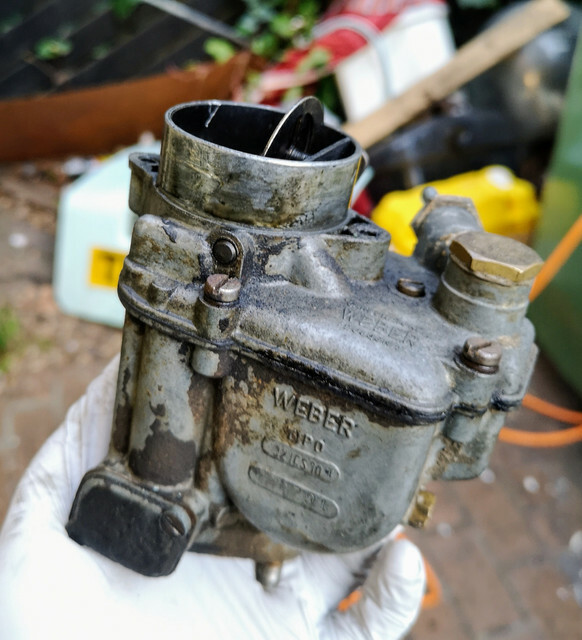 While a bit fiddly not a difficult job by any measure and we soon had the tiny carb off. A Weber 32ICS10 for those of you paying attention. Yep... that's a bit manky. What was in the float bowl was even worse, there's a distinct layer of sludge at the bottom and what poured out had the colour and consistency of a cup of black coffee that's been forgotten about at the back of the garage for a week. It was also discovered quite quickly that the accelerator jet was barely finger tight. 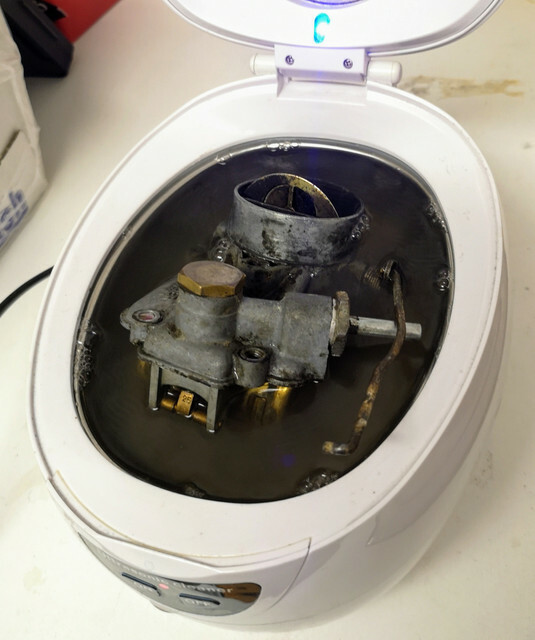 I really need a bigger ultrasonic cleaner. I'll finish giving it a scrub up tomorrow and get it back on the car and see if it's helped anything. To be honest given the amount of crud in it I'm astonished the car was running at all. Anyone hear anything new about the status of the NKT? It's still not working properly. I'm afraid that Simon's not able to solve the problem. Looks to me like it's gone for good after all these years. Not much to report today as I've been busily trying to clear our huge mountain of garden waste. 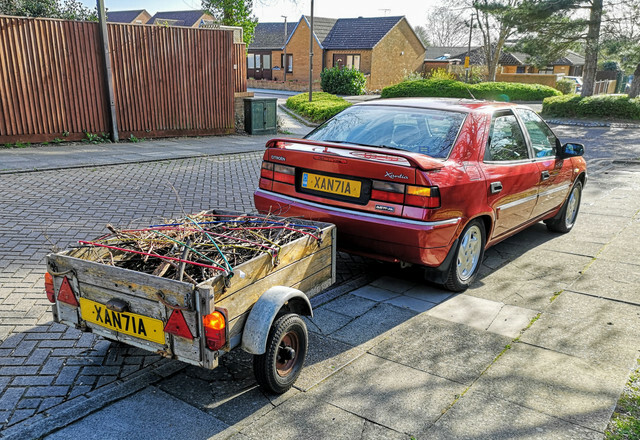 The Xantia and my ancient trailer are helping there. 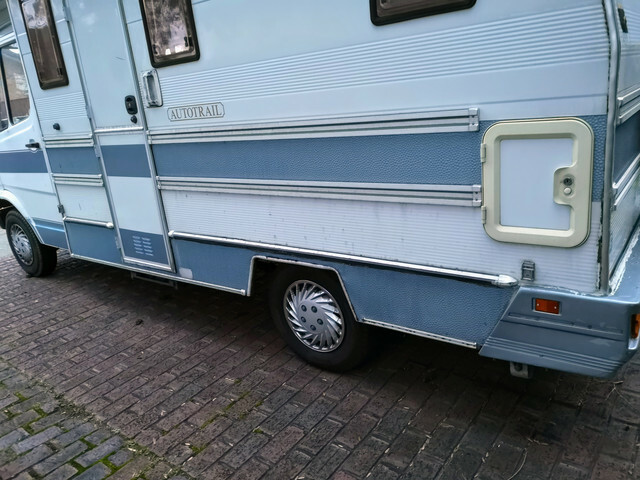 For all the trailer looks rather scruffy it tows really well, yet is light enough that it's (just about!) possible to wrangle it through the gate on its side single handedly. 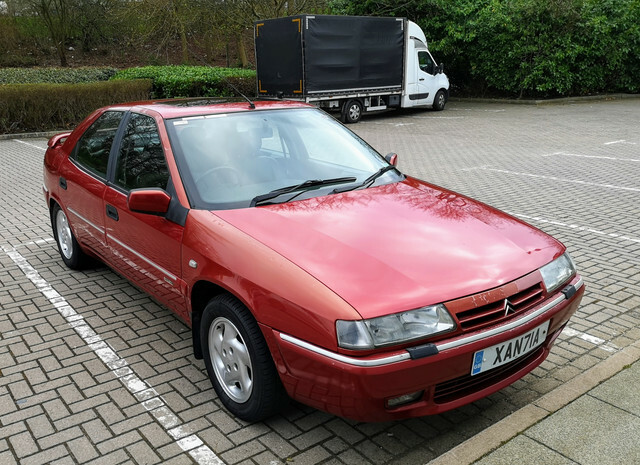 Didn't realise quite how well mannered it was until borrowing a similarly sized modern one from a friend, that thing bounced and skipped all over the shop compared to this. Poor thing really does need a bit of cosmetic work though. Obviously varnish on the woodwork...what do you reckon for the frame? Red, black, Invacar blue or dark grey? I'll be completely redoing the wiring as well as there are so many patches on there it's hard to tell what's part of the system and what's ancient repair work. 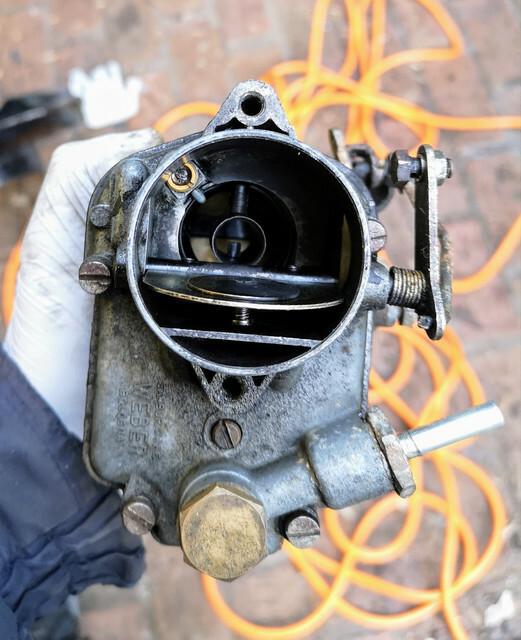 The carb for the Invacar is back together and back in place. Didn't get time to do a test run today, but she's been started up and ran for a half hour or so. Had some misbehaviour for the first few minutes, but I know full well there will have been a bit of water and stuff still in there most likely so not reading too much into that. Hopefully get her out for a proper test run tomorrow. When collecting some tools from the van I managed to get utterly sidetracked and wound up finishing off the tiling in the kitchen. Required a little bit of dismantling to be undertaken so I could get properly into the corners around stuff. Having had it all apart before I knew where all the screws were and such so only took a few minutes and isn't anywhere near as drastic as it looks. Back together in no time. Really need to change the worktops. 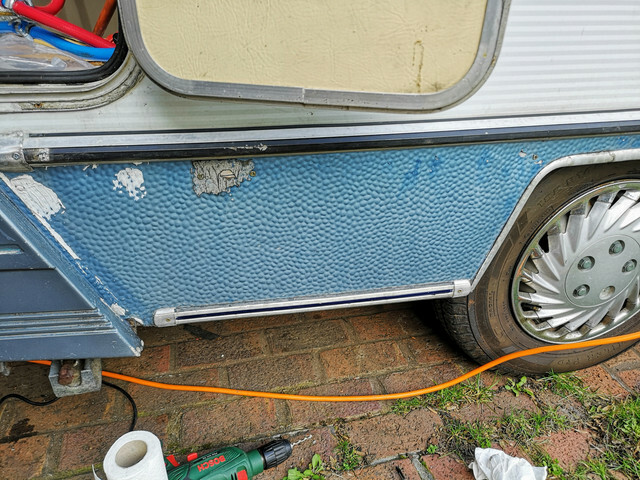 Ideal solution would be to find someone breaking a caravan. Would be the correct lightweight material and should already have spaces for things like the hob and sink already cut out. Nice to be starting to put stuff back together at least. Speaking of putting stuff back together though, anyone got a clue what size these fittings are? The smaller one in the background (the feed for the fridge) is a normal 8mm compression fitting, the rest are slightly larger, and thus far I've not been able to find a match anywhere locally. Unfortunately while I got several boxes of assorted bits and pieces with the van, the rest of these fittings are not present. As far as exterior of the van goes, the one thing I'm missing is a decent set of wheel trims. What I'm ideally after is a set of these, in 14" form. 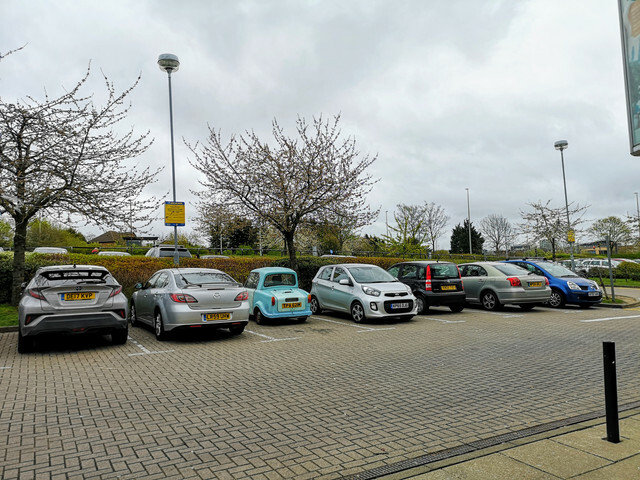 They were an option on the commercial range, though usually unpainted rather than colour coded as on the cars. I'll likely be looking to get them repainted in the same metallic blue as the rest of the detailing on the van exterior. 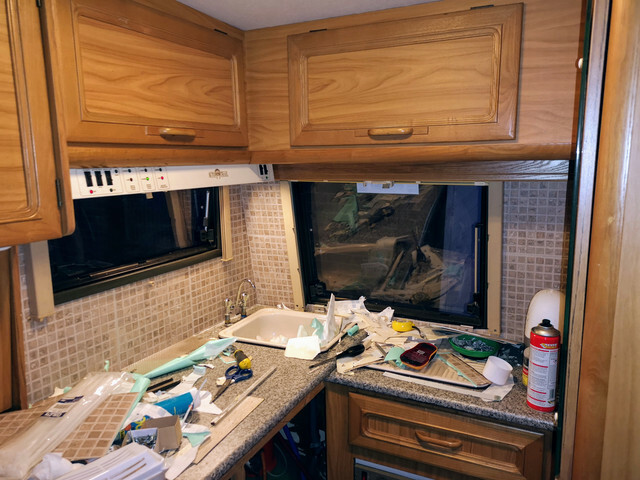 Currently working on sorting the kitchen plumbing out in the van. It's worth remembering that when we got and took this thing to Scarborough that I was up pretty much into the wee hours of the morning we set out to get the services working well enough for a couple of days. 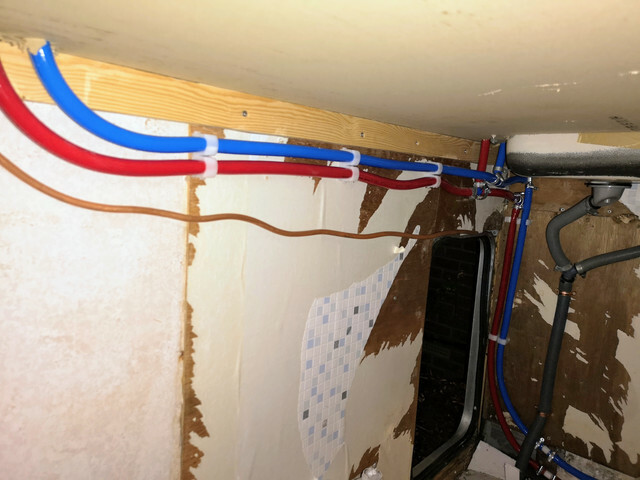 So the pipework connected all the relevant points to each other - but the routing was basically just where stuff landed and nothing was trimmed to size. Just to make my life easier I had managed to end up with no less than three pipes wanting to occupy exactly the same space as the gas cylinder too. Now it's time to sort things out properly. The hot water line here has been trimmed and loosely routed where it's meant to go. The cold shows how randomly they were just thrown in before! The pipe clips I've picked up today can clip onto each other, so it will be possible to get them routed nice and neatly alongside each other. Once that's done I can get the gas lines routed too. Wanted to do the water first as those pipes are more bulky and awkward so were obviously going to set the route. The gas locker is going to have a lot of connections in - so I'm going to run all the lines to it, leak test everything *then* build the sealed box round it...as doing the fiddly bits will be far easier when I've got good access from three sides rather than trying to work in a tiny dark box. Had been hoping to get most of a day to mess around with car stuff today...however it was gone six in the evening before that actually happened. So not a massive amount done, but the pipework tidying from yesterday has continued. I did quite early on do my first idiotic thing of the day when an went to remove the first bit of piping to trim it. I made absolutely sure that the water pump was switched off...I didn't however turn a tap on to depressurise the system, did I? So the moment I pulled the pipe off, I promptly got a rather cold shower. This unsurprisingly made me jump and smack my head on the underneath of the worktop that was folded under at the time. In the process finding another couple of old panel pins still poking out and tearing a hole in one of my favourite T-shirts (and my shoulder). We're getting there though. This is actually starting to look like it's being put together by someone who is vaguely competent now...doesn't it? 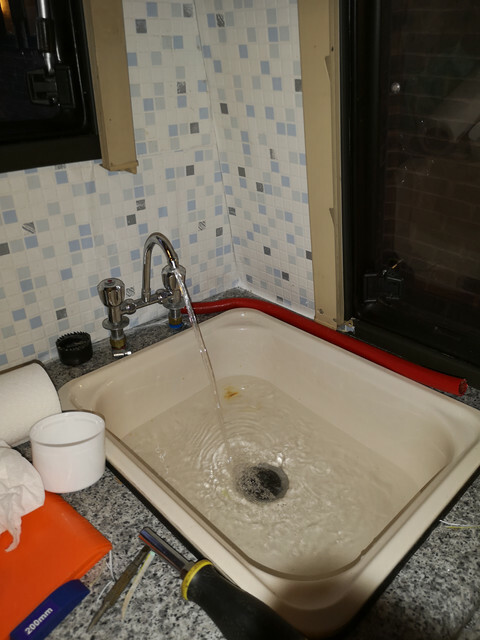 The pipes heading up through to the worktop will be trimmed above the worktop tomorrow as it's way easier to do from that side than trying to get it millimetre perfect while standing on your head in the puddle of water you just spilled. The copper pipe you can see there is the gas supply for the water heater, it will be getting run along there just below the water pipes - once I track down some 8mm pipe clips (or I make up some rubber spacers and just clip an additional 15mm one on to the ones already there) I'll get that done. 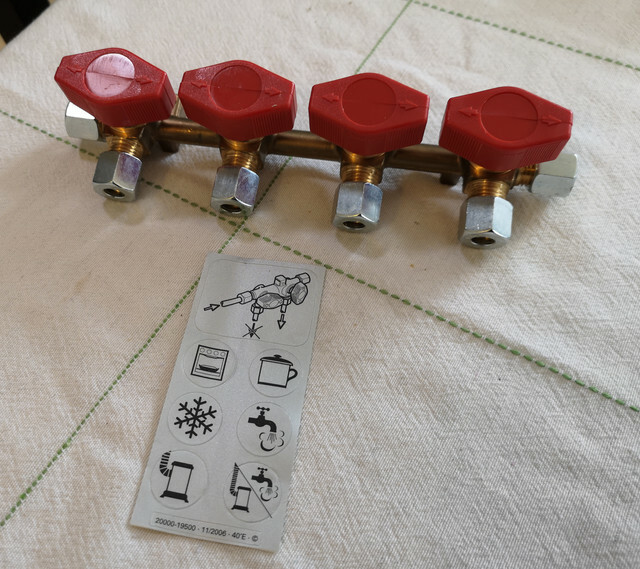 I'll probably pull that pipe out and fit a new one as I'd rather have a single piece all the way from the appliance all the way to the distribution manifold rather than having any unnecessary joints which could be potential leak sources in the future. This is where we stopped tonight thanks to another idiotic blunder on my part. 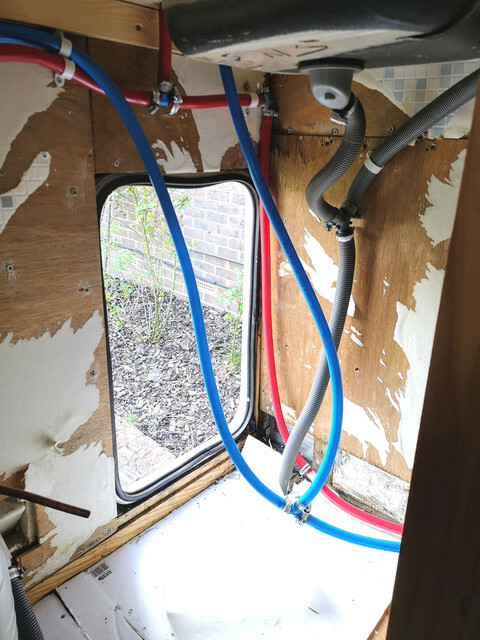 The clips are quite a tight fit (unsurprising given the hoses are thicker walled than the equivalent copper pipe), so you either need to give them a good old shove to click them closed. Or you can thump them with a hammer (especially for the awkward ones in the corner that are harder to get at) and they click straight in usually. Right up to the point you totally miss and instead of the clip you thump your thumb. 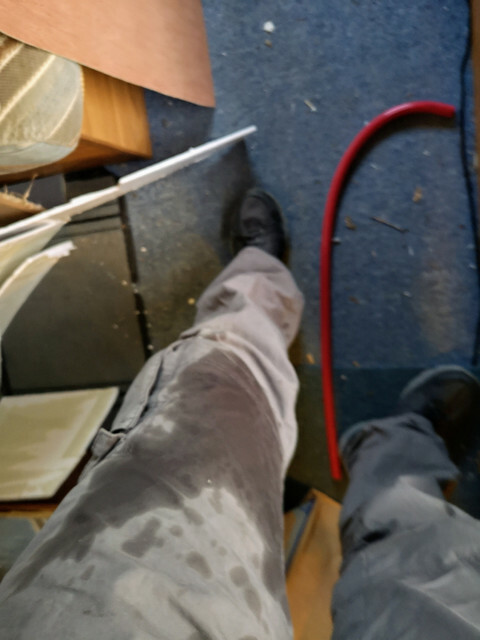 At the time I swore then went about continuing what I was doing - until thirty seconds later until I realised that the *drip...drip...drip...drip...* I could hear wasn't in fact water, it was blood. Maybe I should actually pay attention to what I just did to myself after all! Given I was thoroughly out of daylight by this point I decided to just call it a day. 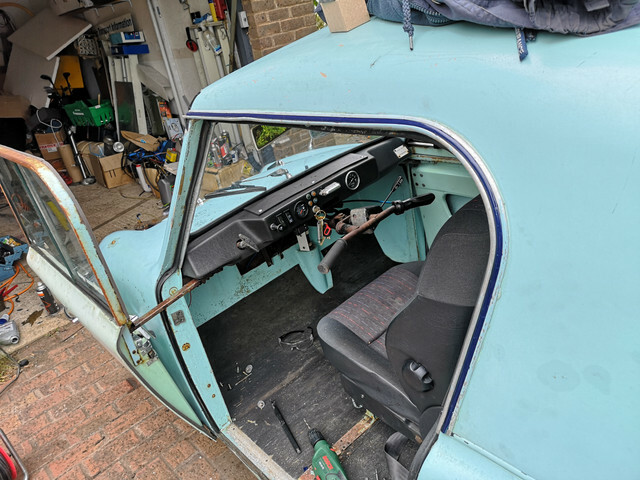 Not sure if tomorrow will see me get some more stuff done here or if I will put a bit of proper time in on the Invacar instead. Readjusting the CVT belt tension (reckon it's currently a bit tight based on the snatching I've been seeing when moving off) and taking the fuel gauge sender out and flipping it through 180 degrees because some idiot (that would be me) put it in upside down. Finally having time to actually sit down let's get the summary for today down. 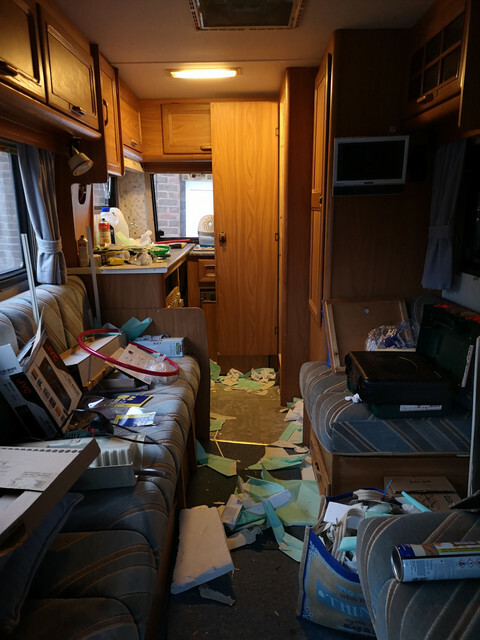 Initially I went to go and finish off what I was three quarters of the way through doing on the van yesterday evening. Within 30 seconds I managed to stab myself under a fingernail with a rough edge of some plywood. I decided that his was a sign from the gods that I should leave the van alone today. No issue there, given I've a list as long as my arm of things that need done on the Invacar. 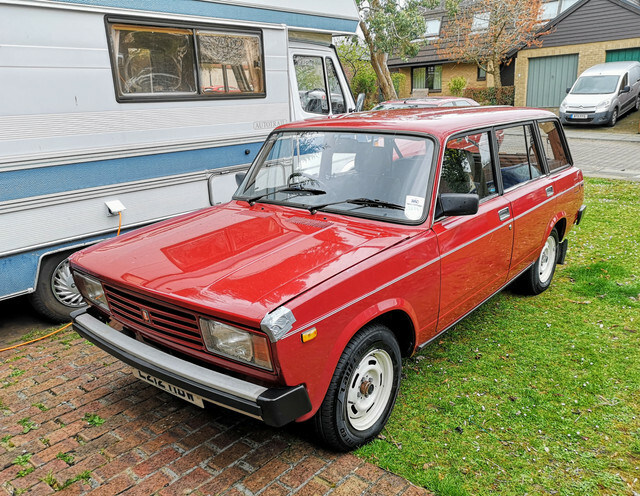 Oh...and Lada...and Xantia. Need to see if my desktop workstation can be revived too...Let's just concentrate on the Invacar. 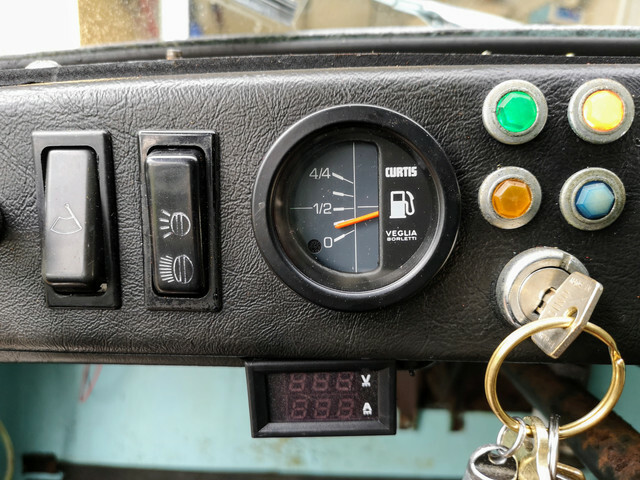 Given that the fuel level had dropped below a third of a tank I reckoned that I should have plenty of clearance to pull the fuel gauge sender and flip it around so it was fitted the right way up. 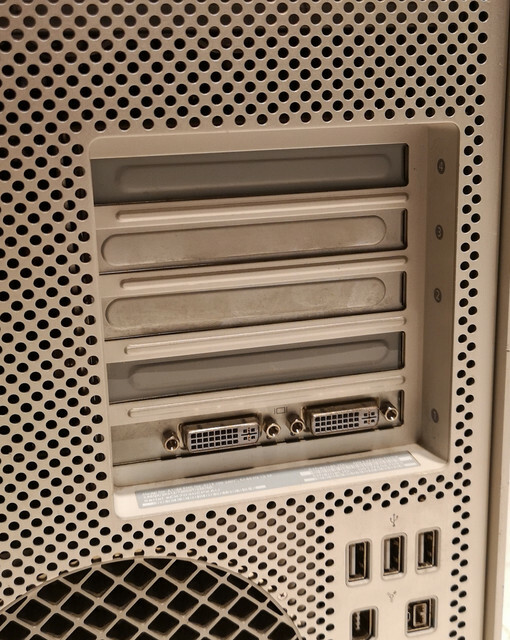 For future reference - the cutout in the case that the wiring comes out of should be pointing directly up. Much better. I did a dip test, and that's actually reasonably accurate, only reads slightly low - which is exactly what I want, following the gauge I shouldn't get caught short. Finally got around to re-fitting the number plate light. I've turned the entire garage upside down several times looking for the little metal trim...No idea what I've done with it. Current plan is to stop looking for it - as soon as I do that I'm sure it will turn up, that's how things usually work here. Having paid careful attention to both the behaviour I had seen on the last few test runs I'd done and watching a couple of videos on YouTube that another owner has just produced where they have fitted a brand new set of pulleys and a new belt, I had decided that my CVT belt needed to be slackened back off a bit. 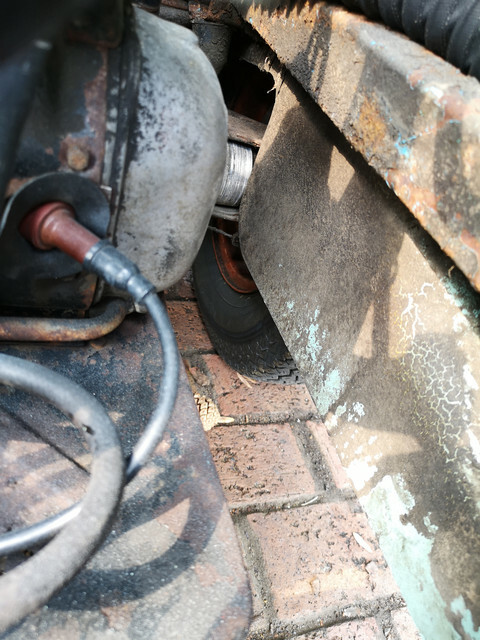 It seems that if the belt is too tight it tends to make the behaviour when taking up drive very snatchy, and as it pulls the belt too far down into the grooves it also messes up the gearing. 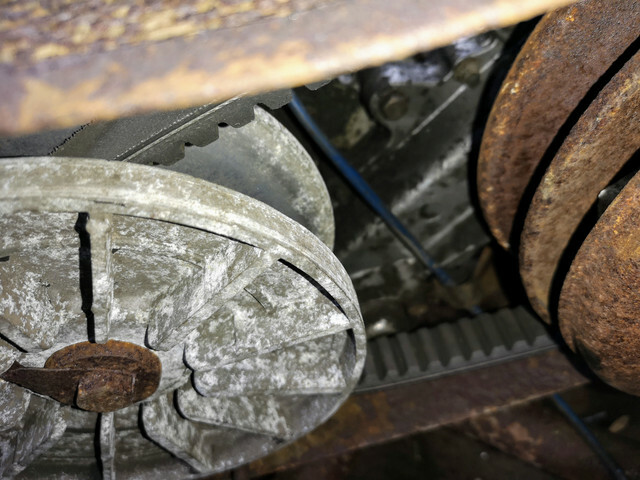 This was quite obvious in that the belt was sitting a good inch down from the outer edge of the secondary pulley at rest, rather than level with the outer edge as it should be. A quick fiddle around with the tension soon had things sitting more sensibly. 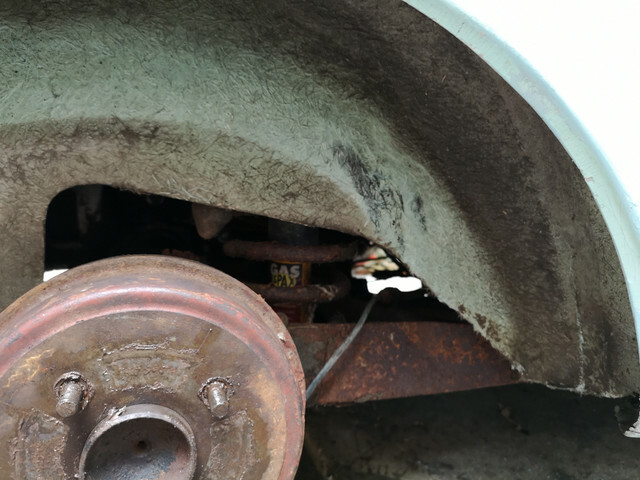 The drive system here seems to be very noisy at speed - My best guess is that this is due to the fact that the secondary pulley is really badly pitted due to rust. The primary looks bad in the photos, but feels smooth save for the last 1/2" or so to touch with just some light pitting at the very outer edge. The secondary (to the right in this photo) is in quite a state though. Time to take to the road for a test run. Once TP got done reminding me that it's far too long since she was last out by blanketing half our neighourhood in smoke when she was first started anyway. There's no emission test as such required at all for a vehicle of this type and age beyond a visual "doesn't emit huge plumes of smoke at idle" check. TP isn't bad at all on that front, just tends to smoke for a few second or two on startup after sitting for a few days. 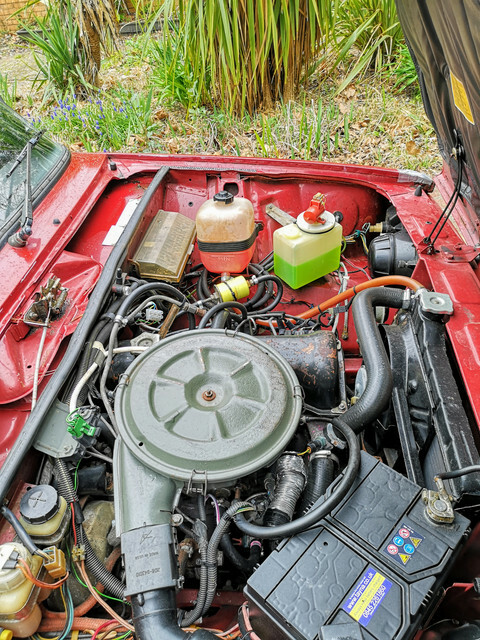 There's no smoke visible on the overrun when driving so I'm not worried about this being symptomatic of worn valve stem oil seals - think it's more a case of "a really basic engine from the early 1970s" than anything else. I'm just going to keep an eye on it, I've a sneaking feeling that it's something that may well get better with use anyway. 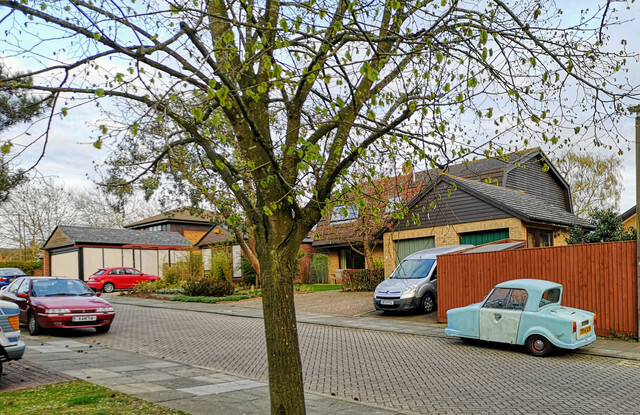 We spent a good half hour or so trundling around our local area, the drive system seeming *far* happier today than on any previous outing, and so far the newly dismantled, cleaned and rebuilt carb has been behaving itself. No bouts of "sneezing" or any carrying on like that were seen other than one or two when she was still cold - and it seems that this happening occasionally is just "something they do" on occasion and shouldn't be worried about so long as it's not excessive. 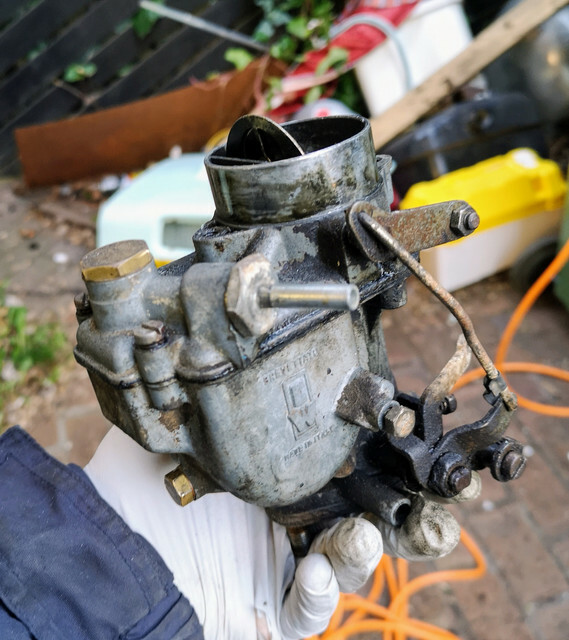 My gut feeling is that it's thanks to the inlet tract being quite long - I think under certain circumstances it takes longer for a richer mixture to arrive actually at the cylinder than it ideally needs to to keep things running exactly right. That's my theory anyway. I was just thinking about going for an experimental high speed run when I noticed something at the side of the road stacked up next to a skip. I wasn't initially sure what it was - but it was clearly some form of tech from the 60s or 70s - something that my eye is pretty well attuned to spotting. Turned out that there were actually quite a few things there which were of interest. 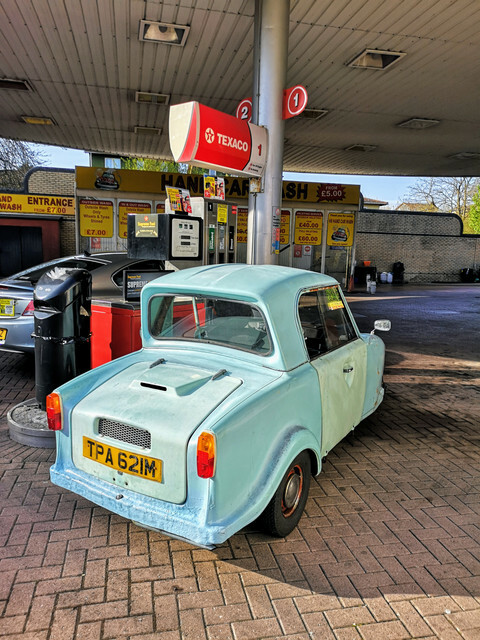 Of course I was in the ideal car for dragging ancient tat back home wasn't I...oh...wait...no, I was in a tiny three wheeler with no luggage compartment of any kind. Well, one of the main things I want to prove is that these little cars can actually manage just fine in day to day life...so she was loaded up! Think we can officially say she's earning her keep by doing actual work now can't we? Turns out that you can actually fit quite a decent amount of stuff in there on account of there being no foot controls. I wasn't actually sure what I had grabbed to be honest...Was vary much a case of purely grabbing what really looked of interest. I may make another run by tomorrow to see if there's anything else worth grabbing hidden a bit deeper. I did speak to the owner of the house and they were fine with me helping myself. The way stuff was stacked neatly next to rather than in the skip very much suggests to me they were hoping someone would adopt some of the now homeless stuff which really was too good to be scrapped. 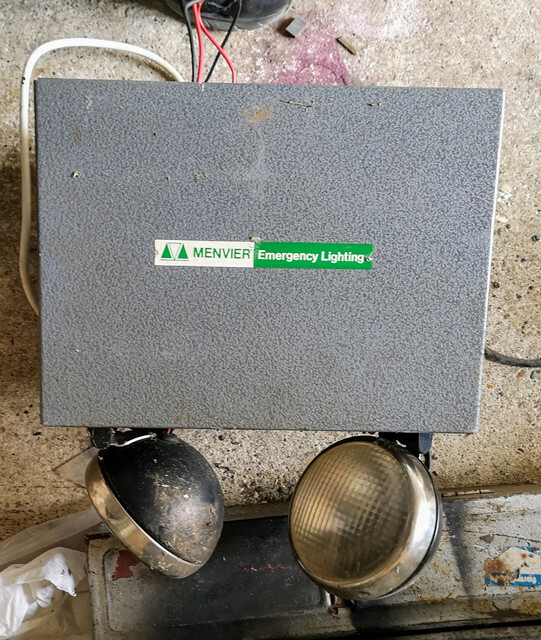 A pair of these old Menvier emergency flood light units for a start. 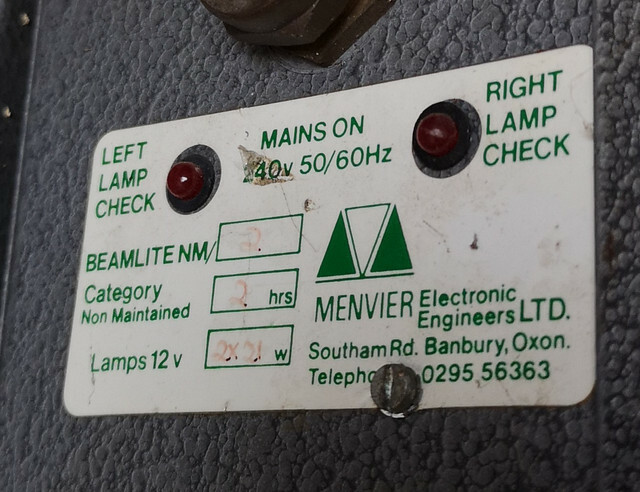 Doesn't feel like they're fitted with any batteries currently, but with a new set sourced that should be emergency lighting for my garage sorted. 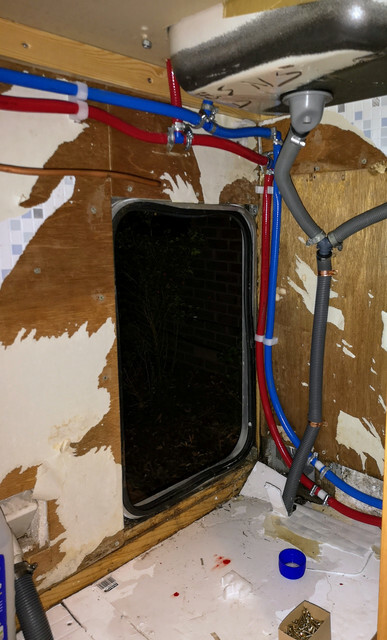 That's something I've been meaning to look into for a while - our fuse box is in there so it's kinda sensible to make sure there is some provision in there. 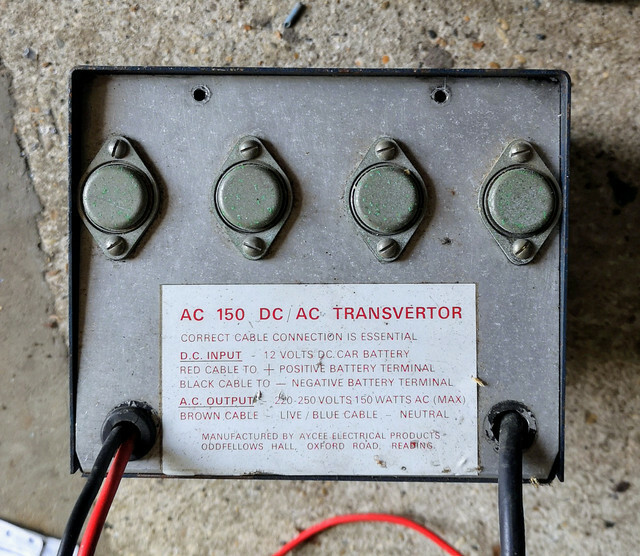 Next thing looks to be one of the oldest 12V DC to 250V AC inverters I've come across so far. Curious to have a closer look at this, suspect that one this old probably runs at a low enough frequency to ensure it whistles in just the correct way to ensure you want to you've your own eardrums out in ten minutes flat. 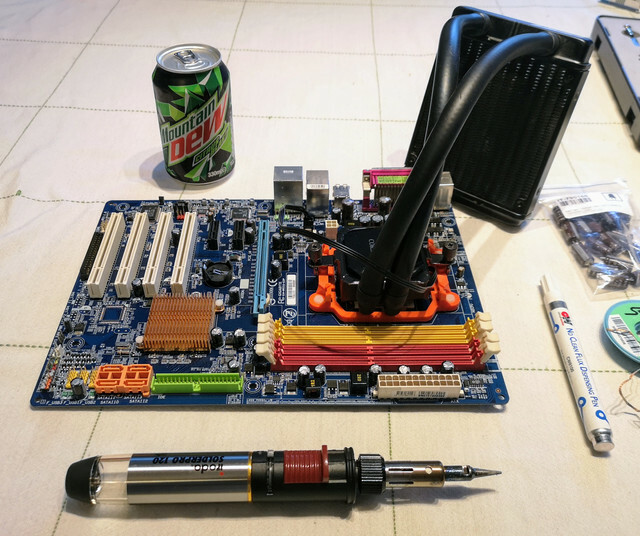 Curious to take a look at how it's put together and what components have been used. 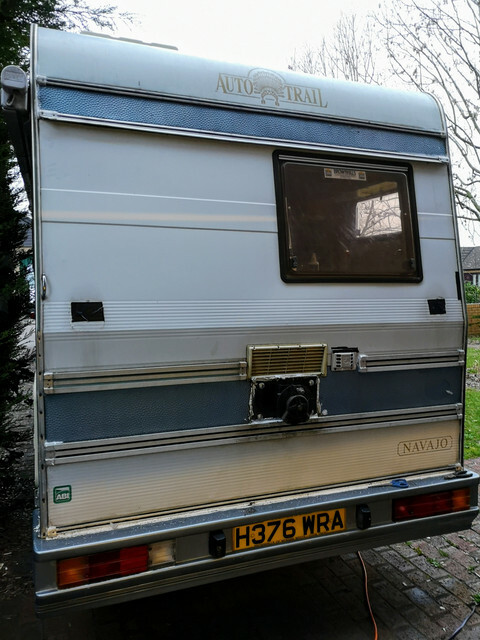 Even if it's not actually used often, could be a nice upgrade to fit to the van too. Not sure what the next one is yet beyond "DC - probably low voltage - power supply of some sort - possibly battery charger." Nearly dismissed this motor under the "don't know what I'd do with it" heading before telling myself to stop being silly, we that it was far too good quality kit to be seeing get binned. For all it looks rough, if you give it a spin by hand it takes a good thirty seconds to stop, so the bearings seem fine. This is what I initially spotted poking out beside the skip which made me look closer and saw the rest of the stuff. It's a teeny tiny compressor...Beyond that I've nothing. As with anything from this era though it's just a really nice...thing. I'll have a run by there again tomorrow and see if there's a receiver to go with this, though I doubt it. Will be curious to see whether it works. 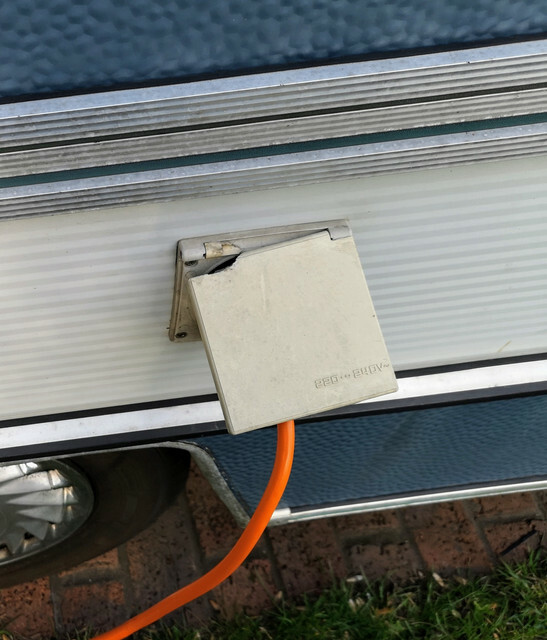 The plastic fitting on the outlet suggests it has been in relatively recent use though, and turning it over by had seems to suggest it is pumping. 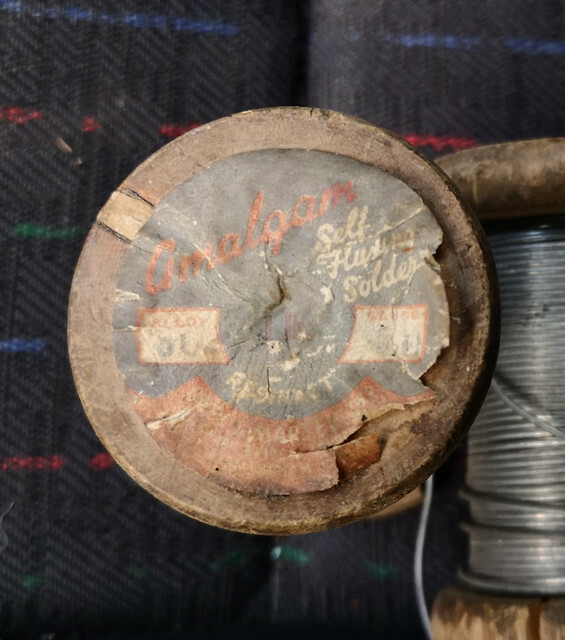 A couple of reels of proper old school solder were grabbed as it's always useful to have around. Last thing I spotted though - literally as I was initially pulling off - was something I've been keeping an eye out for for a while. 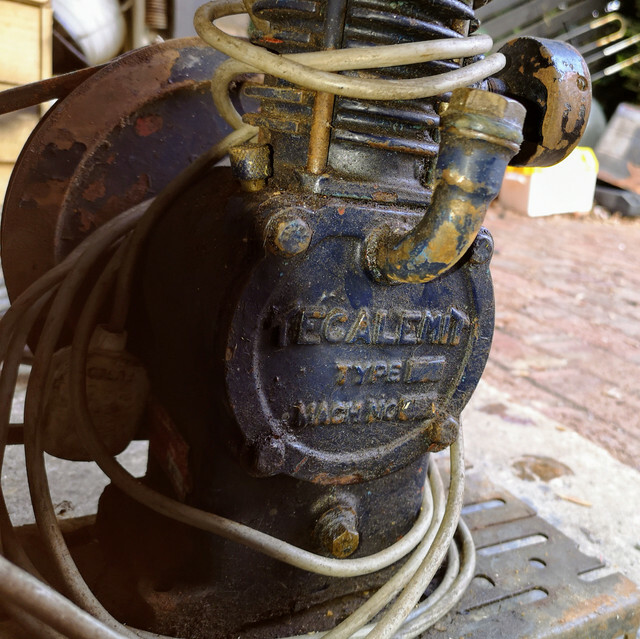 Nice proper old-school pump action oil can. That will look right at home in the Invacar regular maintenance tool kit. Having obviously put my actual plans momentarily on hold when spotting all this stuff and dragging it back to my garage, my schedule was a little behind. I decided that I'd get one more thing ticked off before calling it a day - the high speed test run I had been about to do before I distracted myself by spotting interesting tat at the side of the road. Given the drive belt had been adjusted and the carb was a lot happier I wanted to see if she was capable of handling main road speeds now without excessive drama or any bits falling off. An ideal day for that, as unsurprisingly the grid roads in MK are pretty quiet on a Sunday after the shops have all closed. First three attempts to get up to any real speed were thwarted by almost immediately catching up with and getting stuck behind modern traffic trundling around the 60mph roads at well below 40. Eventually though I did get a clear run on the stretch alongside our area - and decided to see if 60 was something that could actually happen. Yes, yes it is! She will definitely do 60 (well, indicated anyway! 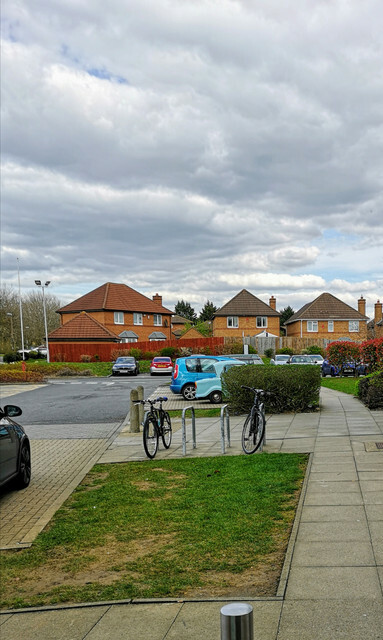 ), even within the relatively short run between our side road and the next roundabout, and on a slight uphill gradient. Time was against me today though given the amount of it I had wasted earlier, so I had to wrap it up there. Sixty isn't nearly as terrifying as some would have you believe - incredibly noisy, but didn't feel as though I was staring death in the eye. Only thing which makes it feel a bit strained at the moment is the low frequency vibration from the drive system, which I think is largely down to the rust on the secondary CVT pulley. Had to do a bit of Automotive Tetris to get her back in the garage, so here's a photo of TP looking triumphant before retiring for the day having both hauled a load of stuff home and then managed to safely reach the posted speed limit. 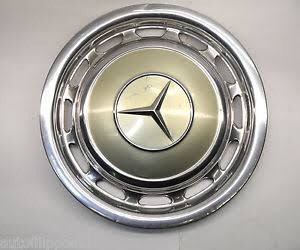 Nicely showing off the hubcaps donated by a friend recently too. Have to wonder, is that the first time that she has ever actually travelled at that sort of velocity under her own power? You do have to wonder with a vehicle like this! I'd say that's quite a decent day really. 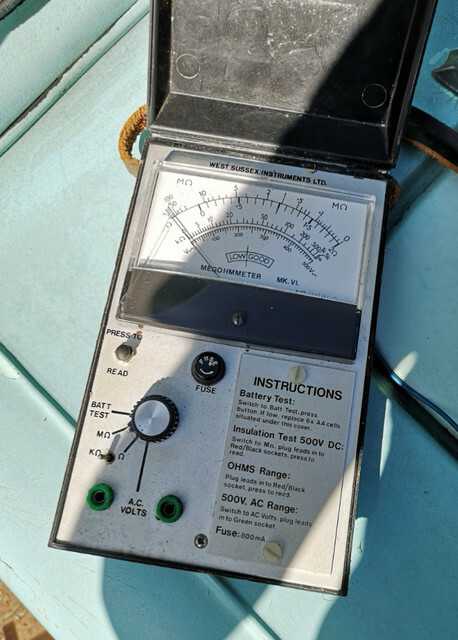 Will get the Megger out tomorrow and if they pass the initial tests, maybe see if any of this stuff works...Then inevitably make another run past to see if there's anything else worth nabbing that I can justify given the limitations on space I have to play with. Today's lot seemed far too good to just leave sitting there though. Figured today I would mostly have a nose at my finds from yesterday. Compressor up first as it was probably the thing that I had the most immediate use for. 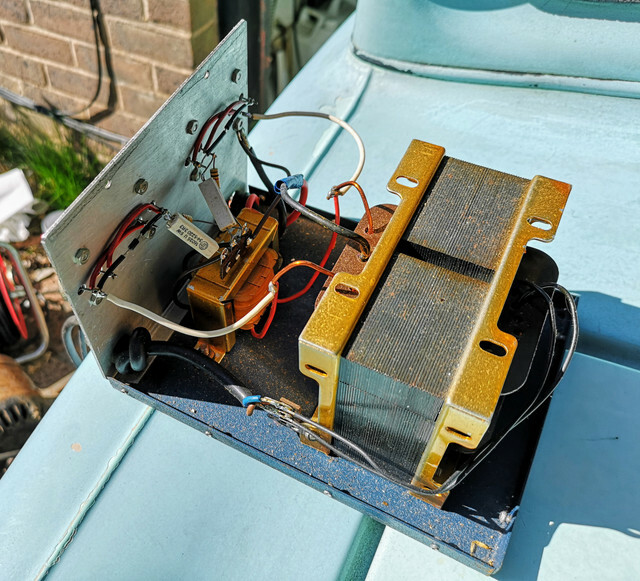 However it had most likely been working fine like that for decades so I'm not about to worry about it until the thing has proven itself - if it does I'll obviously sort it properly before it gets installed in whichever corner of the garage it winds up living in. Doing first tests on stuff like this is where this thing really comes in handy. For those not familiar with their test equipment this is a Megger. 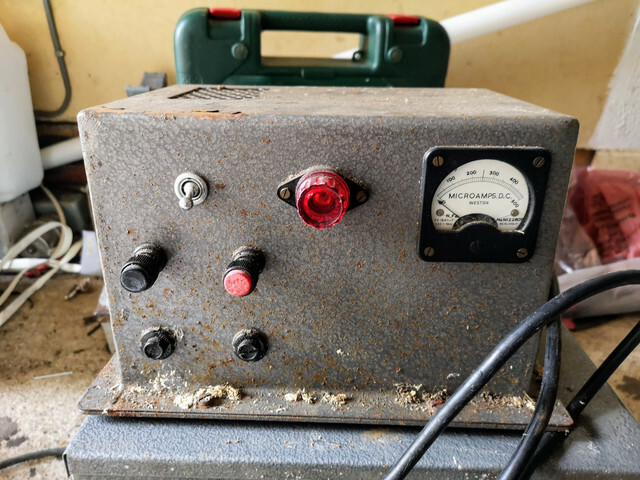 Well, technically it's a high voltage insulation tester - Megger is a brand name. 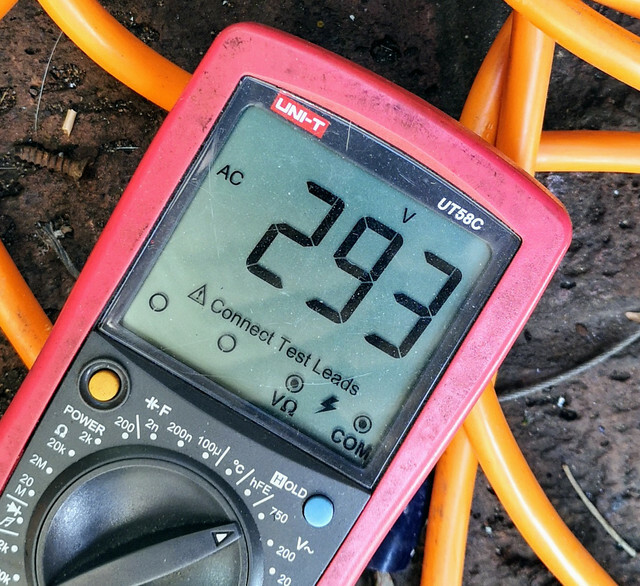 On your average household multimeter when measuring resistance it will apply less than five volts to the test subject. 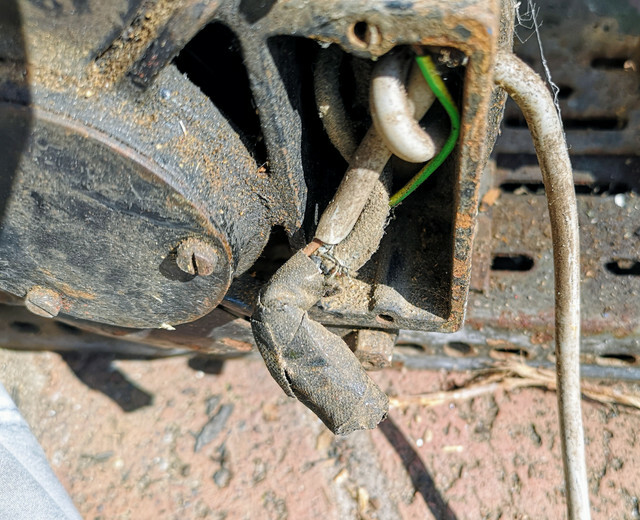 This uses 500V to do that - so can spot where you have issues with insulation that is breaking down at higher voltages, especially often where damp is concerned. You learn very quickly to keep your hands out of the way as it doesn't half sting if you get zapped by it. It tested perfectly and the resistance through the windings looked reasonable for a motor of this size. There was oil in the compressor (it actually has a teeny tiny dipstick) so seemed time to see if it would work. Yes, and it's astonishingly quiet. Certainly won't be a chore to have it burbling away in the garage now and then. No knock from the bottom end at all which is nice. Hooking it up to the only high pressure gauge I have to hand, it almost immediately pegged the thing at 200psi...so it definitely can pump a decent head. The fact that there was absolutely no change in speed of the motor at that pressure seems to suggest that the motor is somewhat over rated for the job. Not going to be running air tools with it, but hooked up to a small receiver and pressure switch (probably still have one from back when I used to help out with some HVAC stuff) it should be just dandy for inflating tyres, clearing stuff out of bolt holes and blowing water off cars after a wash. Stuff like that. Number two was the other random motor that I grabbed. 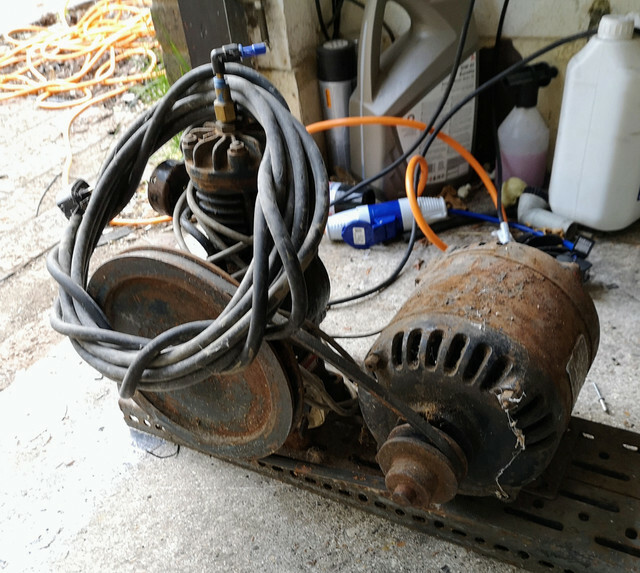 If it's good I'm thinking workbench mounted polisher/grinder. This one is free of any dodgy wiring at least. Hooking it up really surprised me...Very brief hum, then near silence, just a really quiet hiss from the brushes. Turning power back off, it kept going for nearly a full minute before it stopped. Now that's a nice set of bearings! 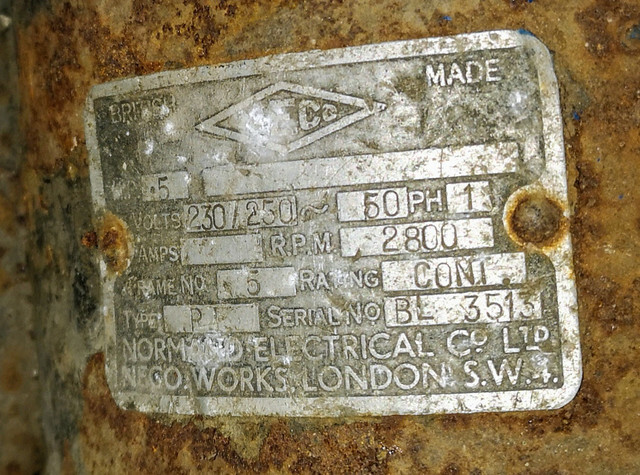 You just don't get quality like that on a general purpose motor these days. Will definitely need to find that a purpose. The inverter was up next. Really wanted to see what was in the box, so the lid was pulled. I wasn't expecting it to be exactly packed full...but I wasn't expecting this little in there! Hooking it up and we had a loud buzz and this on the output. Not surprised it's high given there was no load connected. Reckon this may well take up residence in the van...not likely to have a huge need for mains when off grid, bit nice to have the option. The oil can also works a treat, which is no surprise. 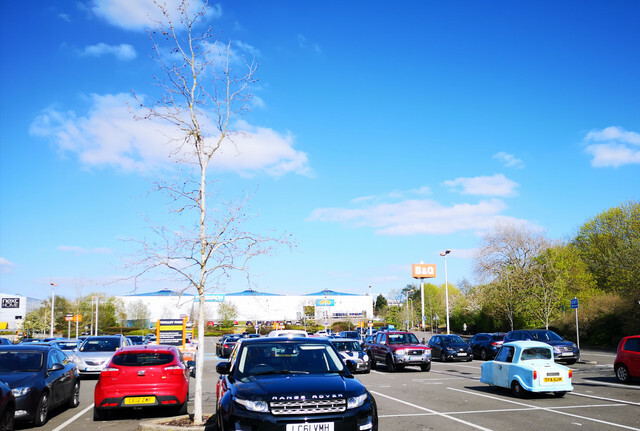 I had a couple of errands to run, and with a bit of confidence from yesterday's test I decided that TP should be my transport for the day...so she went and confused people at Sainsbury's again. Yes...that is a Mazda 2 I'm parked next to...the Invacar is that tiny. On the way home she was fuelled up actually at a filling station for the first time in at least 18 years. This literally brought the filling station to a standstill for a few minutes as the cashier felt it was necessary to come and take a look as he had no idea what it was! 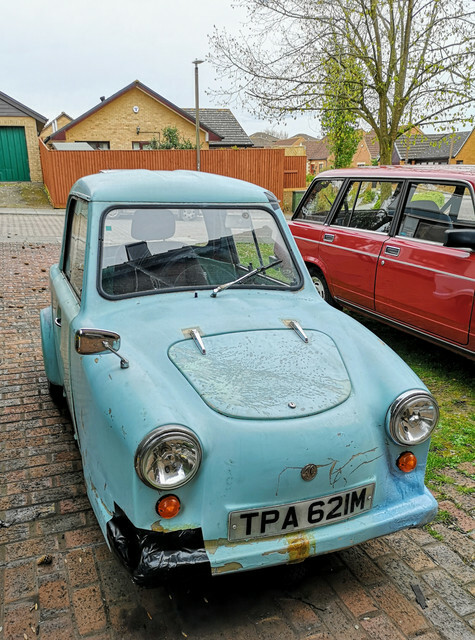 Only 12mpg indicated...but there are at least a couple of hours static running , plus the carb was playing up for a while so no surprise there really! Sadly no video of the high speed run as the camera didn't record it properly for some reason...will try again next time I get a chance. Seems to be running better still...no further fuel leaks from the carb, no oil leaks from the dipstick etc... can't complain. Hopefully she will keep getting better with use. This turned up this morning. So shall be able to get the gas system rebuilt shortly. Figured just buying a new one was easier than faffing around trying to get the ancient one cleaned up and sealed properly. The downpour that we have had overnight has done a good job of highlighting that rainwater is still getting into the one corner of the van. Still not entirely sure exactly where the point of entry is. 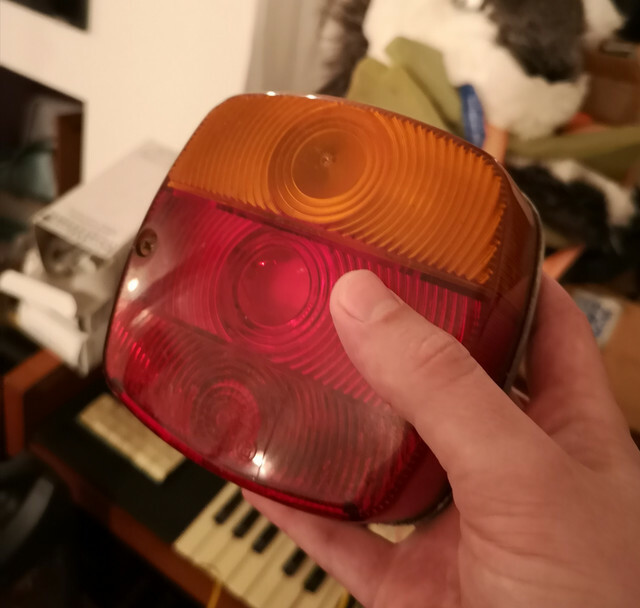 However for the purpose of elimination of a possibility I have refitted and properly sealed the high level tail lights (though obviously this will make myself more MOT prep work as I will need to wire them up now). Not actually a bad idea anyway as one limitation of the of the factory lights in the bumper is that they aren't visible from the side at all - the little orange reflector is just that, it's not a repeater. Plus given the fact that so many drivers seem to be in a complete daze addition of extra lights can only be a good thing. I have also re-bedded one of the bits of sealant just below one of the upper weatherstripping which looked a bit suspect. 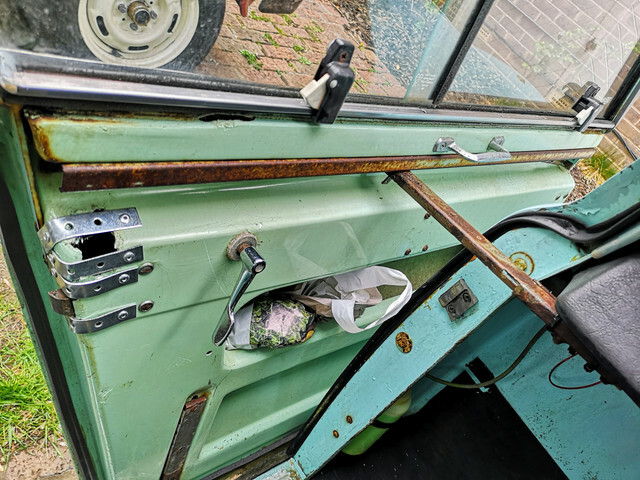 If this still doesn't do it I will just pull all of the strips and trim off the entire corner of the van, clean back and rebuild everything from scratch. Messy job but it will probably be needed. Have also added a little sticker to the rear window showing support for a friend of a friend of a friend who has been going through some exceptionally hard times over in the US. Today has been a rubbish day to be honest. Mentally I have good days and bad days these days (and I have my doubts that the group therapy session that the NHS have offered me - after I make it past the waiting list which is apparently around 10 weeks at this point - will help with that). Today has been a bad day, so finding energy to do anything has been a real struggle. I did manage to get the Lada over to my usual car wash for a scrub up. Felt kind of guilty taking it to them in that state, but needs must. They had kit far more likely to shift that gunk than I did. Did a decent enough job too. Couple of bits missed, but given the state it was in I'm really not complaining - especially as she really needs a polish anyway. 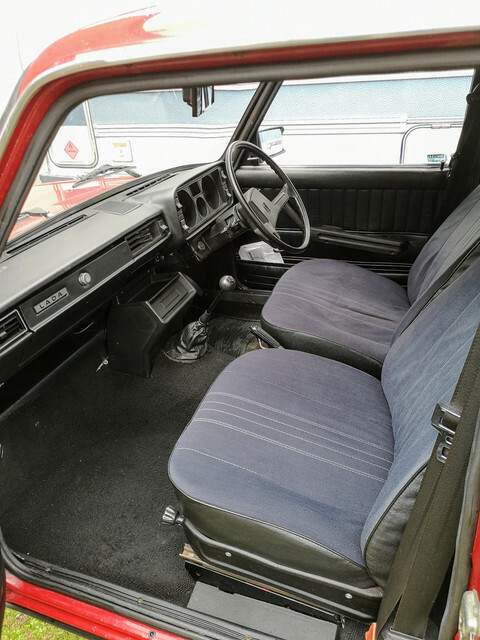 They always do a really good job of the interior too. 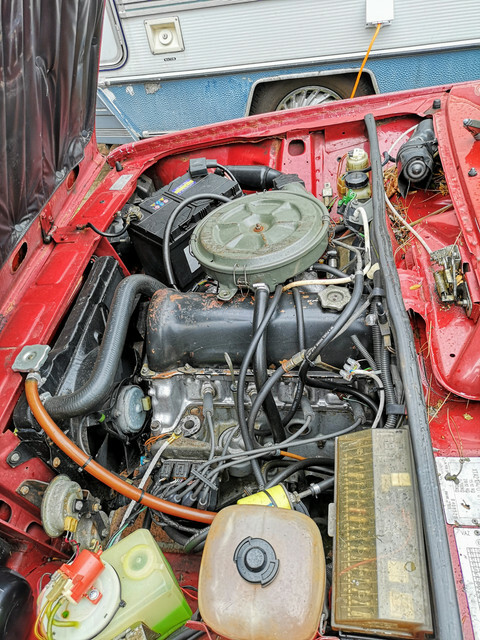 Need to attack the engine bay with an air line to get a whole load of pine needles out of the scuttle etc. Have been chasing it around the van since I got it trying to work out where on earth it lived. 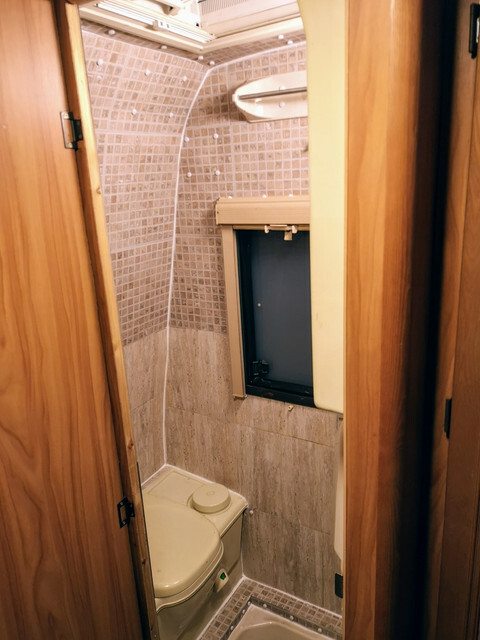 Turns out the answer is underneath the toilet cassette - intention I guess is to help prevent the tank sagging in the middle when it has 20 litres of liquid in. Don't feel too bad, Mara. I'm at a loss now and again and I've been a professional mechanic, body repairman, and auto restorer. My problem is that the Americans and the English are two people separated by a common language. Some things I already know, like "spanner" = "wrench", and some others. Some I figure out, and some I try to get translated. One thing I wonder about: Zelandeth is always using spanners; wrenches. Do they have ratchets and sockets there, or is that a strictly American thing. One thing I noticed years ago is that ratchets/sockets come in American-measurement drives, even though almost every nut and bolt is metric now, drive sizes are 1/4", 3/8", 1/2", 3/4", and 1". There are bigger size drives, for heavy duty use, really BIG stuff, like bulldozers and the like use, and they're in inch increments, too. Here's a question. In the US, the steering wheel is on the left and we drive on the right. In the UK, except Canada, the steering wheel is on the right and they drive on the left. Hong Kong and I think Japan, too. But in the US, in how many states is it legal to operate a right-hand drive vehicle? Driving on the right side of the road of course. If there's ever anything you'd like me to explain further please feel free to ask. In my mind there's absolutely no such thing as a stupid question. While I'm UK based, the fact that I've spent the last twenty years speaking to folks in the US daily means that my terminology tends to drift between the two, especially if I'm tired when writing! I think the reason that the drive sizes for socket/driver sets have never moved on to metric is mainly legacy support and lack of drive to change. Metric really simplifies stuff when you're picking between thirty or so sizes, but when you're only dealing with two or three it's less of an issue. 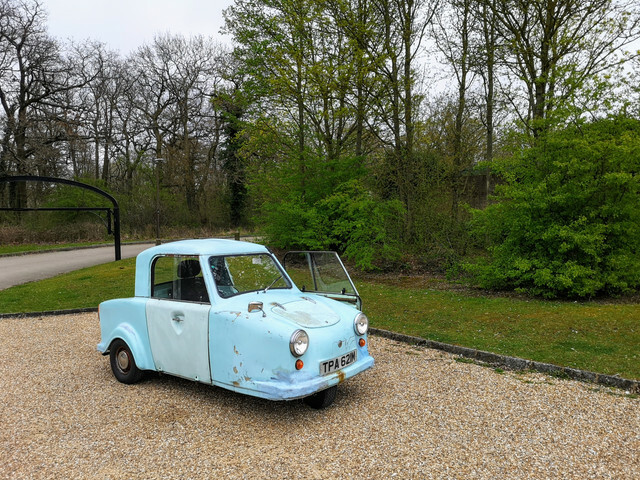 I was quite pleased with how the Invacar behaved when I last had her out. So when I had a local trip lined up this afternoon if obviously made sense to take her rather than have the Activa drink another half gallon of fuel. While only a couple of miles across the town centre, this would be the furthest from home that I had ventured so far. Did she make it? Of course she did. 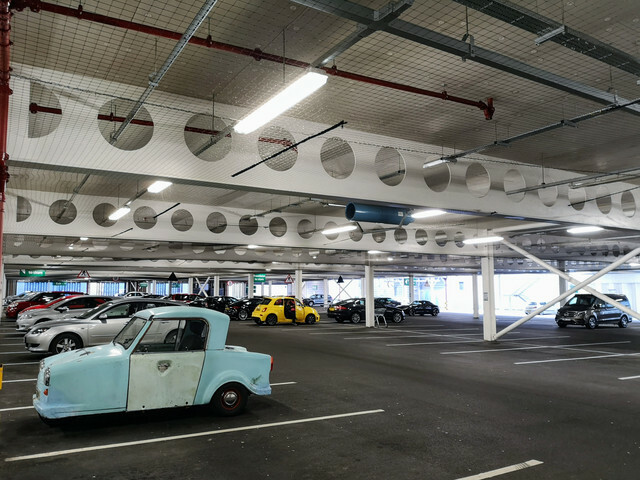 Place only opened a couple of years ago, so I doubt there has ever been an Invacar in that car park until today. Had to swing by the pharmacy on the way home, which left me the opportunity to watch out the window for several minutes watching people walking past TP and be totally baffled by what they were seeing. The size comparison to a Skoda Roomster is somewhat comical. Back home an hour or so later and a milestone has been reached. 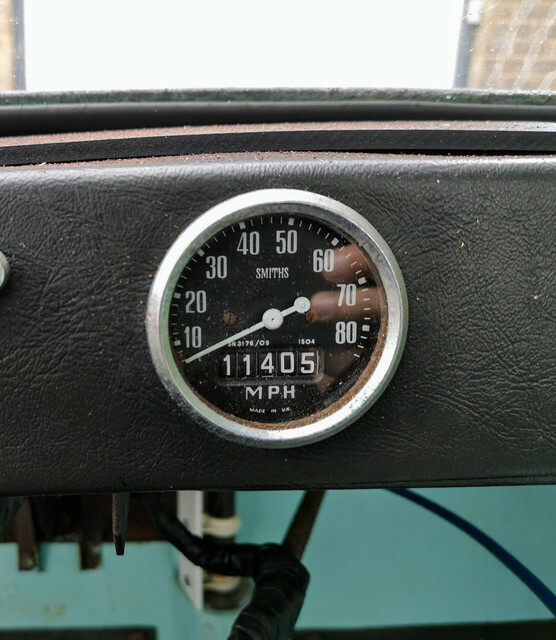 Those of you with far better memories than me will recall that the odometer read 11353 miles - the first additional mile was done attached to a drill when the engine change was underway as I wanted to confirm that the odometer worked, so call it 11354. So at close of play today that's 51 miles covered since the previous keeper rescued her from that field. She definitely earned her keep today...proper week's shopping onboard. Didn't miss a beat either, so as a reward for good behaviour I got a small but important detail seen to. Finally put the badge back on. Not quite sure whether this will make people more or less confused when they see her now. A few shopping bags have now been assigned to the car for future shopping trips. Which I know I will never remember to take into the shop with me because I never do. I reckon based on my experience today that bungee may get stuffed in one of the doors to help keep stuff still as the floor mats combined with shopping bags appear to result in zero friction whatsoever...so my shopping slid all over the floor and was generally an utter pain on the way back. The carb I am glad to report seems to be reasonably happy now. 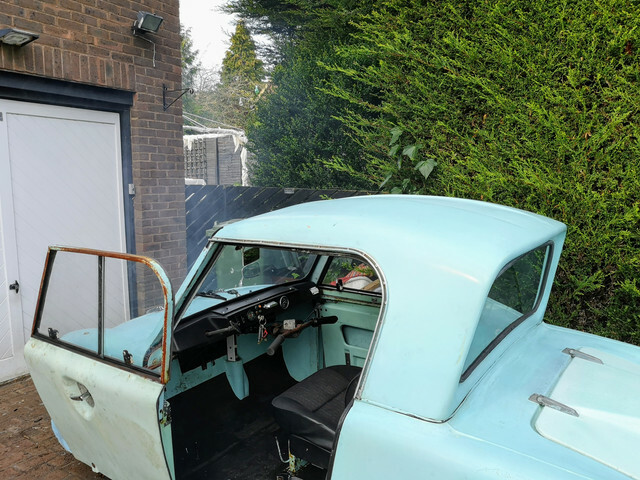 Only grumble with it is that the choke cable has come off again, but given she lives in the garage that's hardly a major issue, I'll sort it at some point. The only recurring gripes are the grumbling drivetrain - which I'm pretty sure at this point is down to pitted pulleys (I do have a plan in mind to see about cleaning them), and the dead travel in the brakes. That's better than it was but still needs improving ideally. Now we have passed the magic (and utterly arbitrary) 50 mile mark I will probably drop the oil and change the filter this weekend as if there's gunk floating around in there, it has probably been washed into the sump by now, time to clean it out. 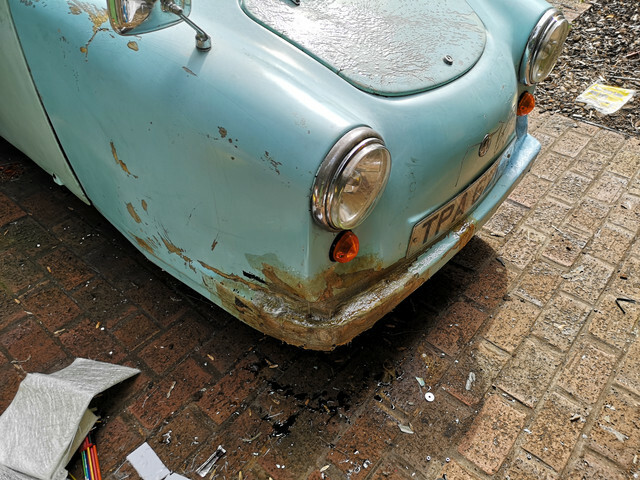 Really do need to do something about the front end bodywork now too, especially given the car seems to be getting into a vaguely usable state now...the duct tape and my laughable first attempts at fibreglass need to go...I can do a lot better job of that now. Hoping that this weekend I will have the opportunity to get a few more miles covered. 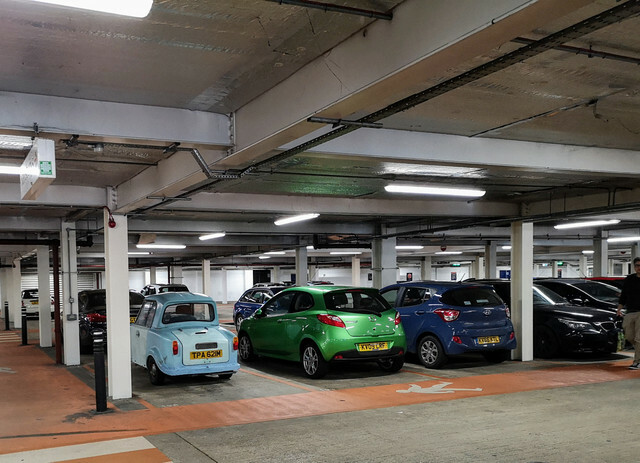 Would be nice to get a photo of her somewhere other than another underground car park! Encouraged by the success of the let couple of runs I figured it was time to start working on getting TP looking slightly less like an escapee from Scrapheap Challenge. The huge chunk of duct tape on the nearside front had to go. 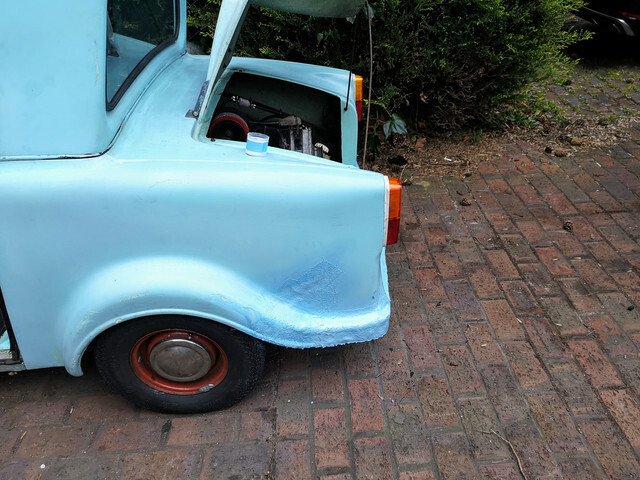 While I was at it I finally got some matting down over the huge crack in the offside rear quarter with a view to actually tidying it up at some point. On the subject of cosmetics I also figured that it made sense to get the infill strip in the gutter put back in. The original one had turned to plastic so atomised when I removed it. However I have tens of metres of the stuff for the van, so nicking a couple of feet wasn't an issue. 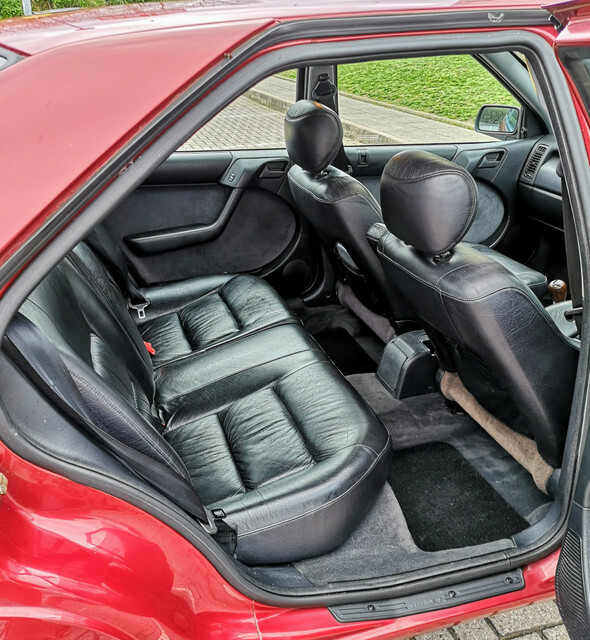 This actually does a lot more to tidy the car up than I expected - which shouldn't have surprised me given the visual impact of doing the same on the van. 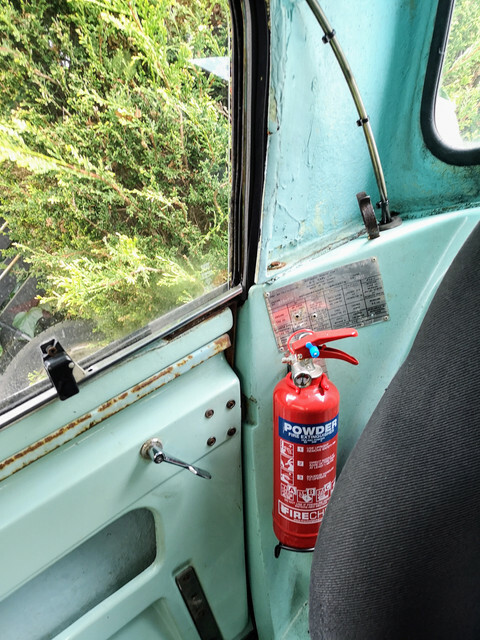 The original fire extinguisher was a huge point of concern for people. As a result I have made the decision to swap it for a modern one. 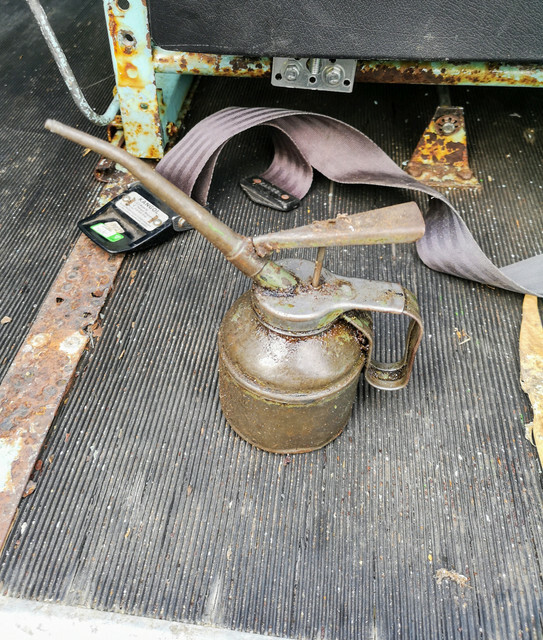 It's a shame that whoever fitted the original extinguisher just drilled holes in the vehicle build plate. I will probably move the extinguisher at some point as I really don't like it there. 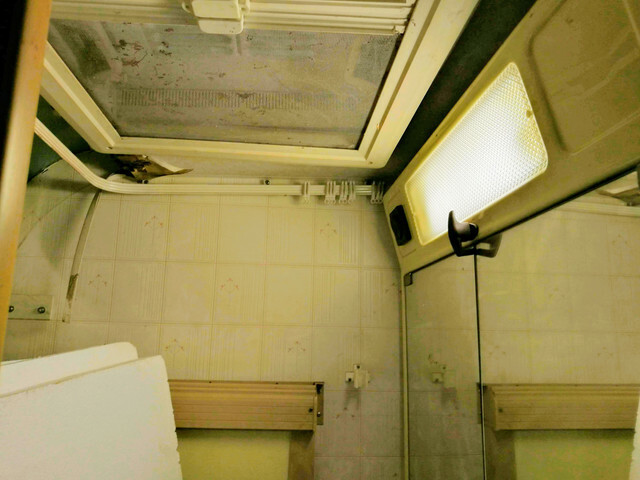 It looks messy and gets in the way whenever you want to get the service hatch out. 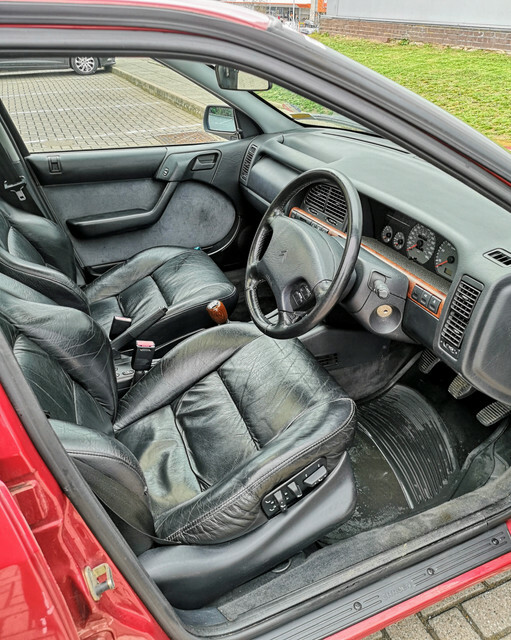 I reckon in the footwell on the opposite side of the car to the washer bottle would be better. Easier to grab in a hurry too I reckon. This lot done it was time to get some more miles done. My aim for today was to get ten miles done in one run...doing the math when I got home...nine miles! Blast! Oh well, just have to try again tomorrow! 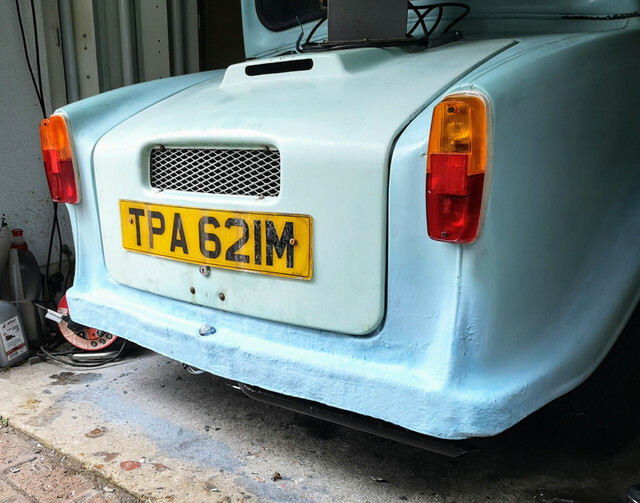 First step was Halfords to pick up some more paint as I ran out halfway through throwing some colour on the bodywork I had just done. Man this thing is tiny. Unsurprisingly she generated a bit of a crowd and several people took photos while I was walking back across the car park. Given she seemed to be behaving pretty well I decided to take a slightly roundabout route home to give me the opportunity to get a couple of photos somewhere slightly more photogenic. Back home with more paint I was able to throw some on the bodywork I had just repaired. Definitely getting there. Really looking forward to getting her out of the garage for some time on the road tomorrow. 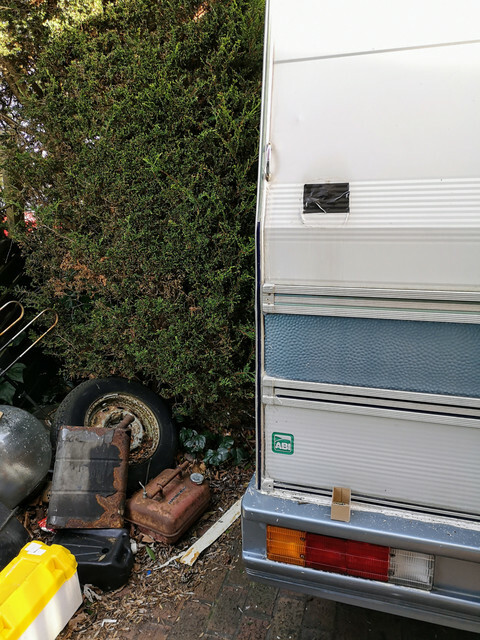 Backing the van back into the drive (I have to do some automotive Tetris to get to/from the garage) the exhaust suddenly became louder - didn't take long to discover why. Interesting. Especially interesting in that the engine feels far more responsive now...so I do wonder (especially in light of where the silencer is split) if something has collapsed in there causing excessive back pressure. Will see what I can do about this shortly. On the plus side, having separated this join will make getting the main silencer off though. It's heavy enough to be almighty awkward even so. 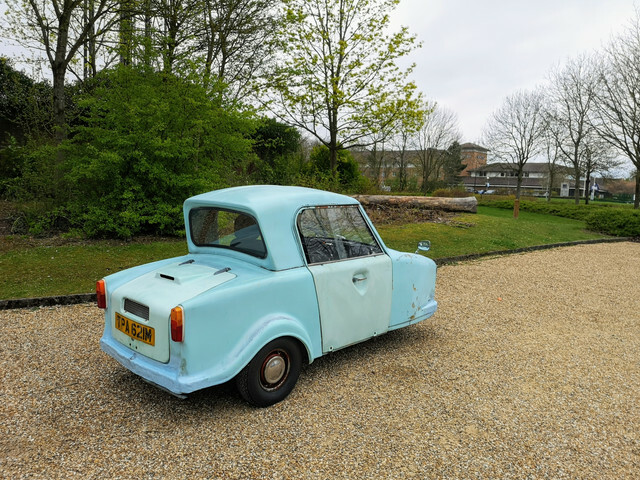 Hopefully tomorrow will include confusing even more people by driving around in a tiny blue car. 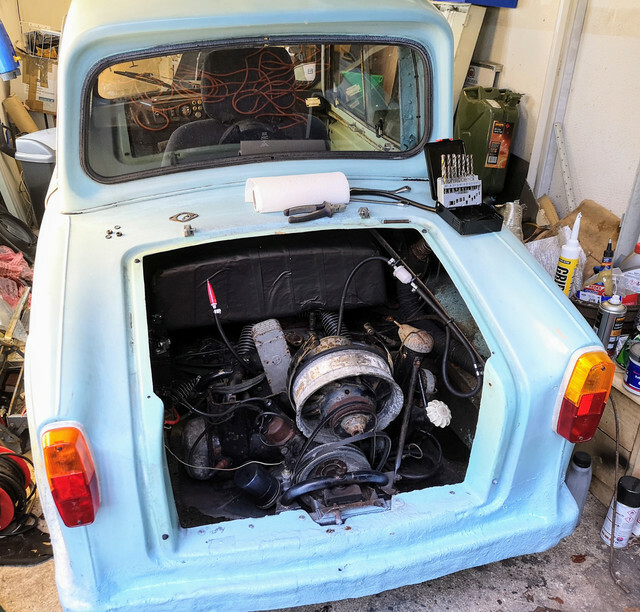 At least it is beginning to look like a tiny blue car and not a "whatever is THAT???" Not a big report from today. 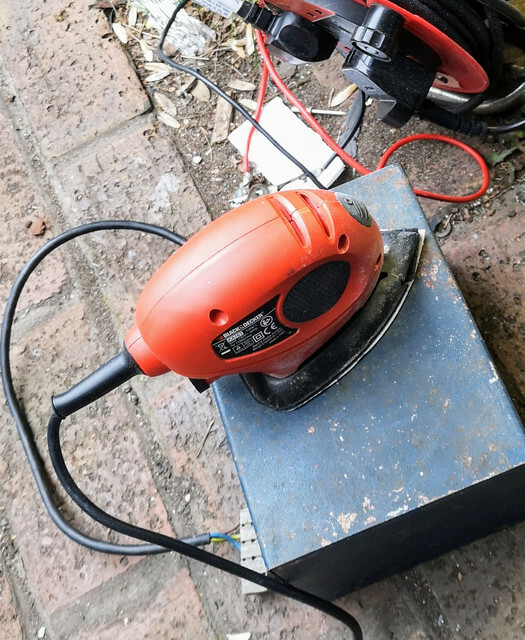 One tool I had been missing for a while was my little sander - which finally surfaced today hiding in a box in the shed. Not the foggiest idea how it got there, but it's back where it lives now. 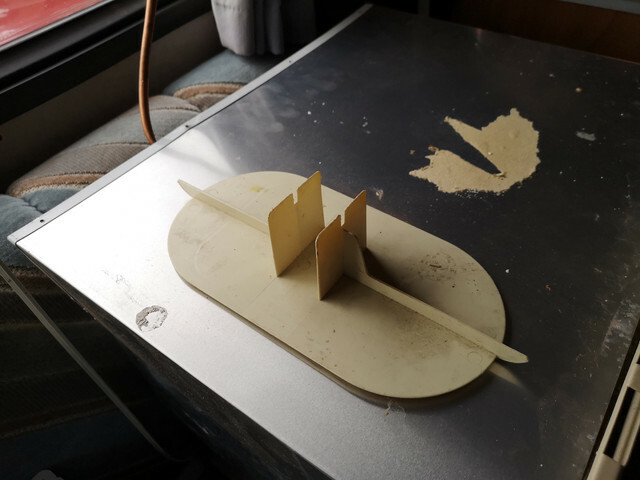 Main reason I had been looking for this was so that I could get working on smoothing out the surface of my newly made bodywork. As you can see looking closer, it does need it! Not going for a Rolls-Royce mirror finish here, but hoping I will be able to get it reasonably flat with a bit of work. The above image shows just some of the high spots sanded a bit. Quite clear with a very quick spray of paint that even a few minutes of work has improved things. Unfortunately while I found the sander - I did not find the sanding discs to go with it. Full gas tank in soldering iron, solder present, flux pen present, caffeine present... let's go. Twenty minutes later the offending caps were swapped out. Did this resolve the problem? Of course not. Went back and changed all of them in the power supply section of the board in addition to the ones that were visibly cooked, still nothing. 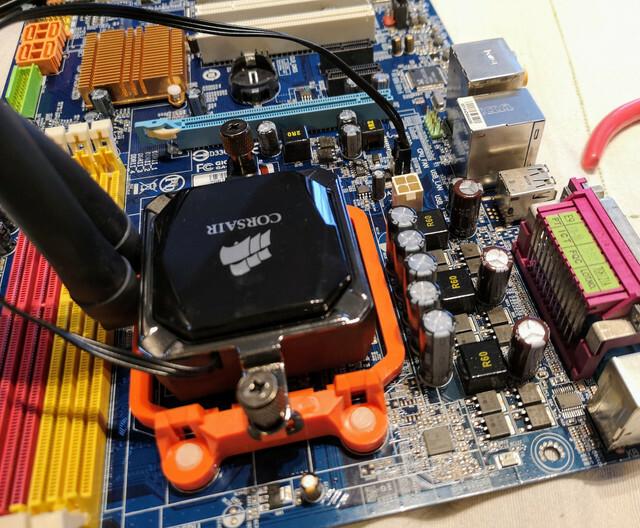 It appears that there's a deeper problem as there is still a lot of current being drawn from the additional 12V ATX connector, yet absolutely no signs of life from anything. I have a sneaking suspicion that the CPU isn't even running given the lack of heat being produced... I've tried...but it's time for a new board now methinks. Twelve years ain't a bad run really by today's standards. Every time I do any work on an exhaust I swear that it will be the last time. Today was no exception. 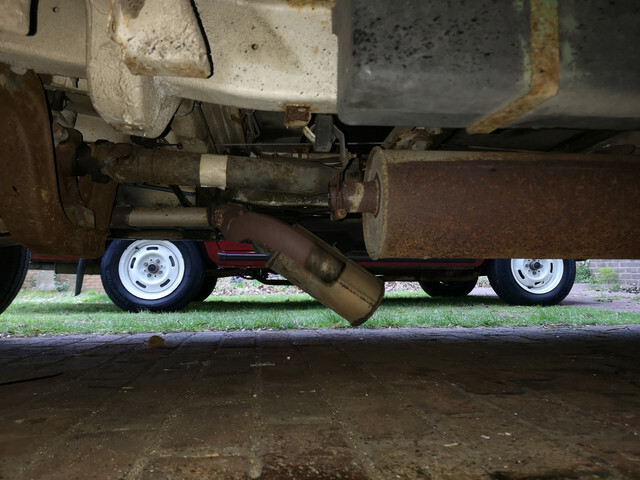 The van's exhaust consists of four main assemblies. Both the expansion box and silencer one mine are stuffed. 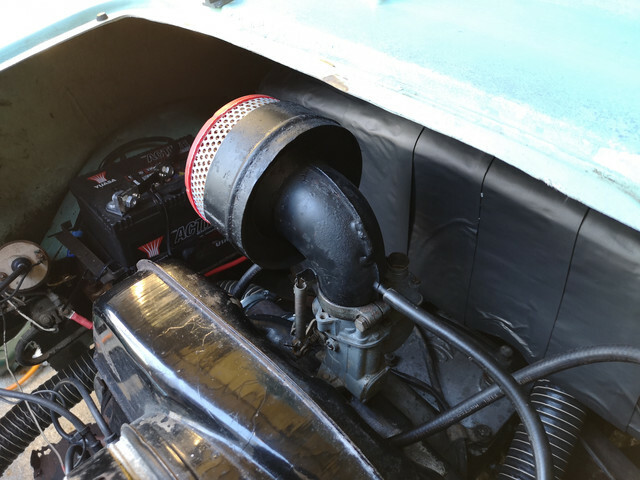 The silencer has a heap of holes in and the expansion box suffers from a broken hanger in addition to one of the baffles having come loose so it buzzes like crazy at idle. Pretty sure the main silencer had collapsed internally as well, making the system far more restrictive than it should be. 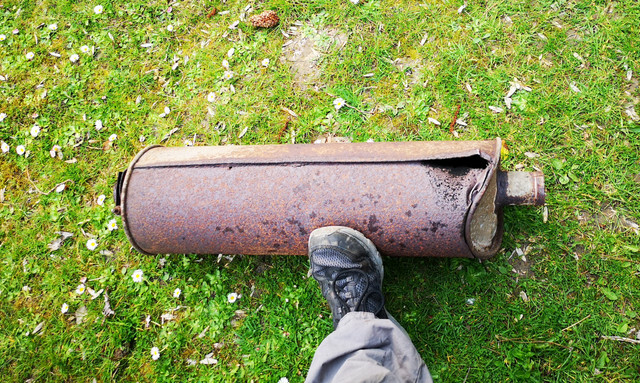 After roughly two hours of swearing, hitting things with hammers, heating stuff with a blowtorch then burning my fingers on it, I finally wrestled the main silencer off. 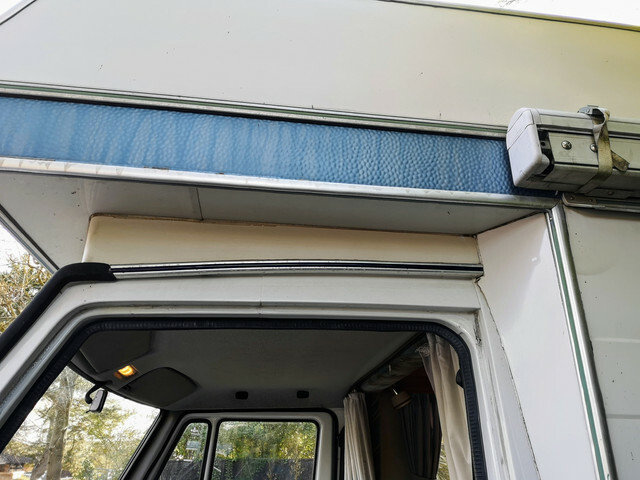 I really want to get a better designed stainless system fitted with the tailpipe venting to the side of the van well clear of any air vents, but may just have to settle for a stock system until the MOT is out the way. 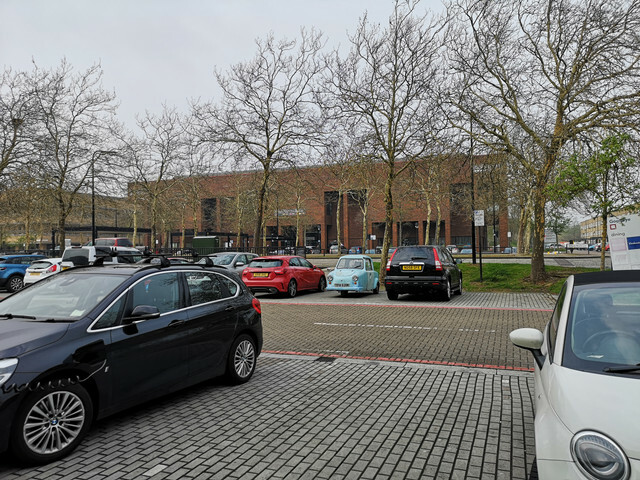 The Invacar was out and about again today, confusing people in central MK. She does a pretty competent job of being a local runaround it seems. Having a check over when back though it looks like something has been touching the sidewall of the nearside rear wheel. Investigation this afternoon in the one hour of actual time I had was for the rub mark I had spotted on the offside tyre inboard sidewall. Pulling the wheel off made it pretty clear that something had been touching, albeit not particularly hard. Looking in at the wheel arch helpfully there was a nice clear witness mark where the tyre had been rubbing. 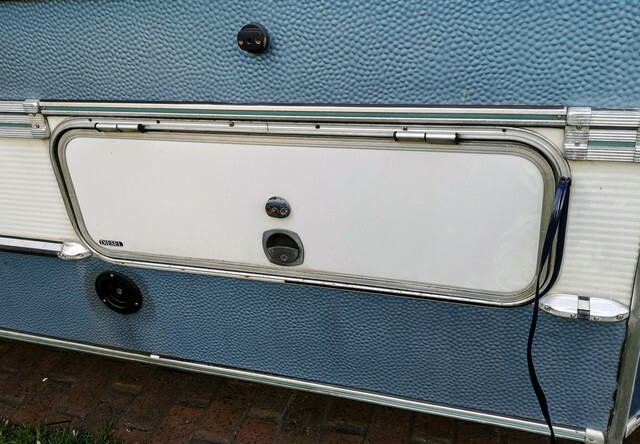 Turns out that the whole body moulding there had a good 3/4" of wobble because the tiny 1/4" bolt (no washer used on it) at the top of the wheel tub meant to hold everything in place had pulled through the body. This affected pretty much everything from the rear of the door to the tail light. I drilled three holes to the rail behind there and using nice big washers riveted the back of the wheel tub to the chassis. Whole area is rock solid now, and it looks like we have more clearance. 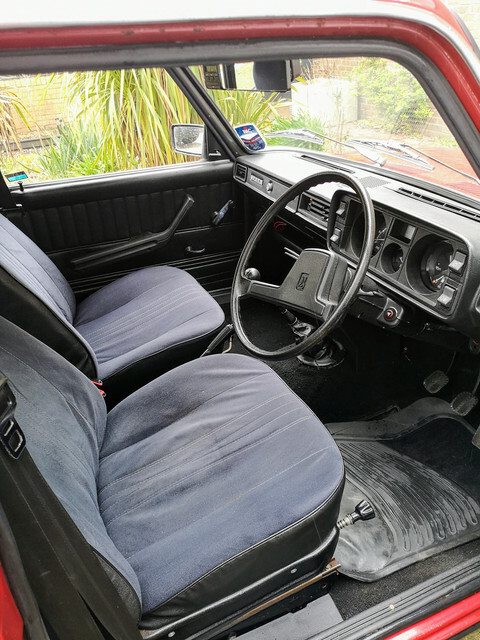 While I had the wheel off the ground I also took the opportunity to adjust the handbrake again as now fifty miles have been covered the shoes have bedded in a bit as you would expect. One thing I had noted on all my previous high speed runs had been a very noticeable smell of hot rubber, will be interesting to see if this turns out to be the culprit rather than the CVT belt that I had automatically been blaming...doubt I'm lucky enough for it to be the cause of the vibration at speed too, that's more down to the condition of my secondary pulley I reckon. Having a closer look at the area where the bodywork was originally rubbing on the wheel (having figured out I could use my phone to get a better look) shows we now have reasonable clearance. Taking a look at the opposite side shows that it seems to be fine too. 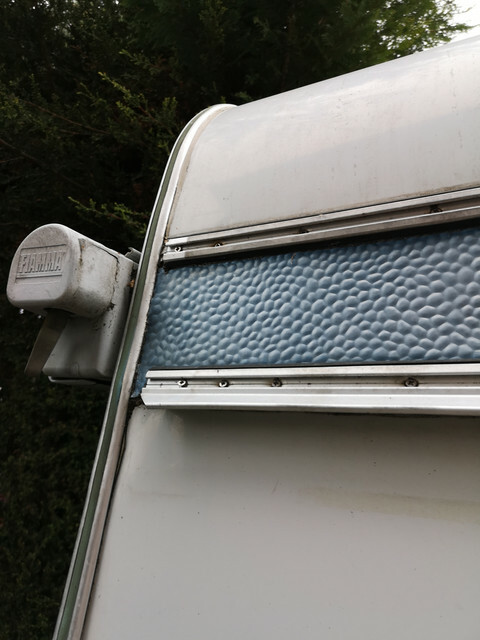 I will probably add a couple of rivets to this side though as there's quite a bit of wobble there, given it's a five minute job it just seems to make sense and is likely to help prevent issues in the future. Never really got a decent photo of the badge when it was refitted a couple of days ago so fixed that today. Yes I do realise how utterly pointless details like that are given the cosmetic state of the car! 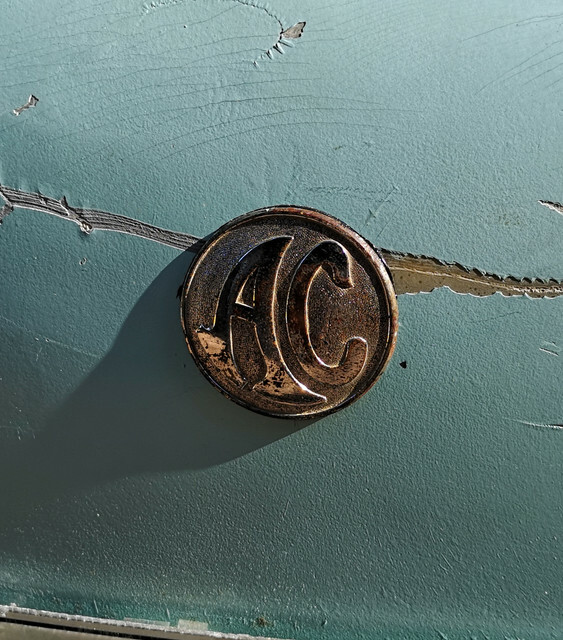 In honesty though the badge is far safer on the car, it would have been very likely to disappear into one of the bottomless boxes of bits otherwise, probably never to be seen again. 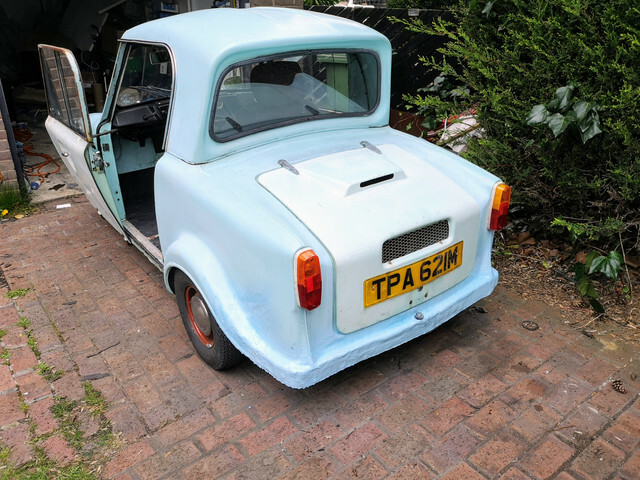 Had a few errands to run today so they were of course an excuse to get the Invacar out. Next up I needed a few things from Toolstation...this however involved having to brave the dual carriageways. This was nowhere near as terrifying as you might have expected and we arrived in one piece. Sorting the wheel arch has definitely noticeably reduced vibration at speed so the wheel rubbing definitely played a part there. She's still not exactly refined, but far better... there's also no longer an obvious burning rubber smell entering the cabin as soon as speeds head north of 30mph. On the way home though we did see further signs of the drive system not being entirely happy with life. 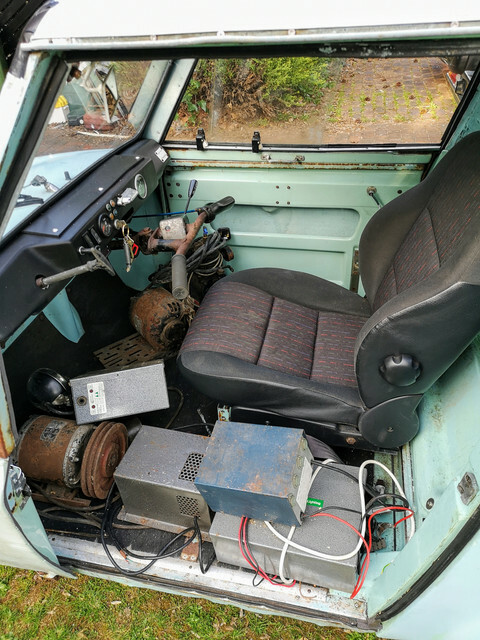 Any real attempt to get above 45mph resulted in obvious slippage in the drive system with it shunting between "gears" so I just dropped to 40 and took it easy back home. I'm not really surprised by this given that save for a couple of experimental belt tension adjustments I've not touched the drive. 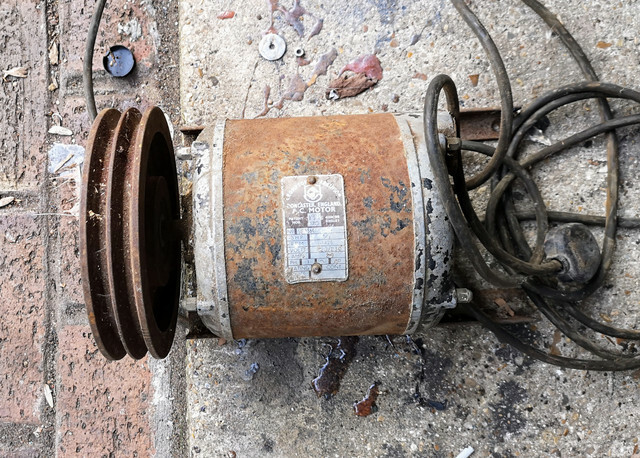 The secondary pulley in particular has a badly pitted surface...so I'm going to pull them both off tomorrow and give them as thorough a clean as I can with the equipment I have to hand. I'm also going to give the belt a careful check over and will replace it with one of the spares I have in stock. For all they're old the rubber seems to be in perfect condition. Given I know new pulleys and belts are readily available at not unreasonable prices I'm not going to persevere too far beyond giving things a good clean and resetting the belt tension (which after 60 miles may well need attention anyhow, any further issues and I'll just get replacements on order. Brief interlude, but you know me so the odd off topic happening is inevitable. A week or so back my workstation PC died. It's made it to twelve years having barely missed a beat so I've no complaints really aside from it being inconvenient. Having had a decent dig around it was diagnosed as being a pretty fundamental problem with the motherboard. 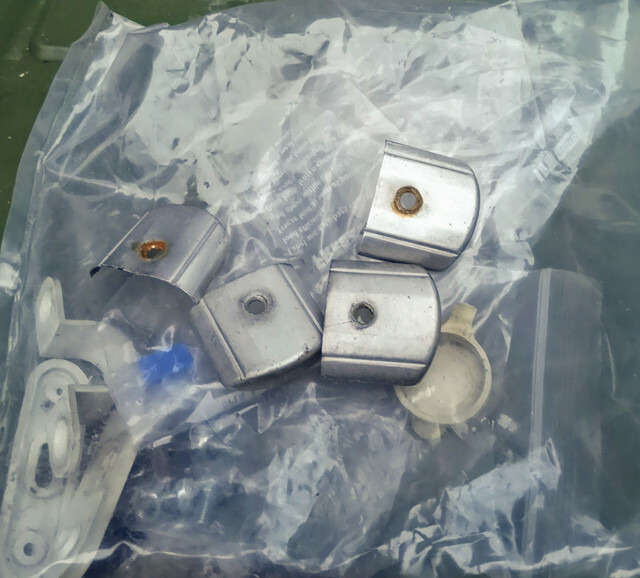 Some crispy looking capacitors were found and replaced, when that didn't help, all the remaining electrolytic caps were changed - still dead. Given the age of it, it's rebuild time. I'd retain the case, power supply, hard drives, optical drive and (assuming I could track down a motherboard which still had support for it!) the floppy drive. So new motherboard, memory, CPU and probably graphics card. Helpfully though one of my friends who has a house full of old computers stepped up and offered something which should get me back up and running for a while. I had an older machine they wanted though, so we did a trade. Can't say I will miss moving this sucker. It's the holy trinity of heavy, awkward and fragile. 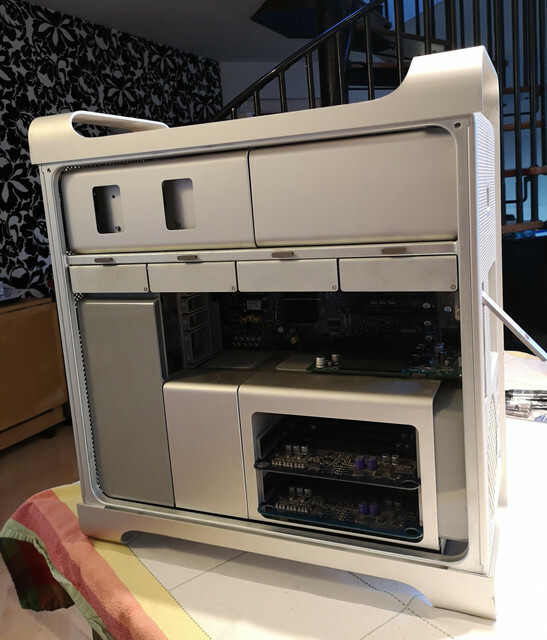 It's a PowerMac One/225. Essentially a Performa 5500 in all-in-one format. This mission did however require me to break one of my rules of driving though - venturing into London. Generally my rule is that I Do Not Drive inside the M25. This required me to go about ten miles past it. Blarg. To be honest that was anticlimactic...busy as always, but one thing which was really obvious was that it's way less cut throat now that pretty much everything aside from the main distributor roads are 20mph with cameras every ten feet, so you have to obey the limits - I remember last time I drove in London a few years ago that I felt like I was perpetually being bullied into going far faster than felt comfortable. The London bit was fine...shame the M1 was an utter nightmare though, both ways. So what should have been a few hour job wound up taking pretty much the whole day. Still, made it home eventually with a new toy to play with. Now I make no secret of the fact that I'm not an Apple fanboy. I like the old Classic machines like the original Macintosh (I have a Macintosh SE that I really need to do something with sometime), and I keep trying to convince a friend to sell me one of his very early Apple IIs, but I've little interest in anything newer than that. I will not however deny that these Mac Pro series machines are things of engineering beauty. My OCD refused to let me not replace the two missing expansion bay covers. No they're not anodised the same colour as the case like the originals, but at least they're present. 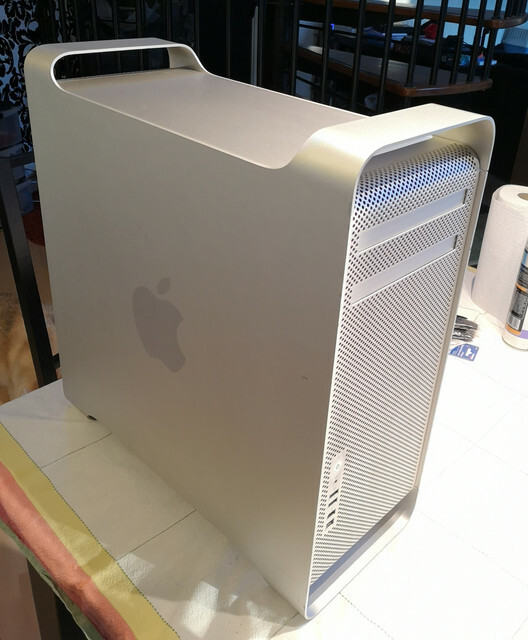 Yes this is a machine from 2006 or 7, but with a pair of quad core Xeon 5355 processors and 16gb of ram (which I'll be maxing out to 64gb shortly simply because obsolete server grade ram is stupidly cheap) it should be more than capable of keeping up with my needs for a while. Tomorrow it will be getting a thorough de-dusting and some software thrown at it. Thankfully being a late enough Mac to be an x64 based machine it will happily run Debian - if I was tied into MacOS that probably would have been a deal breaker! Should be interesting to have a play with. 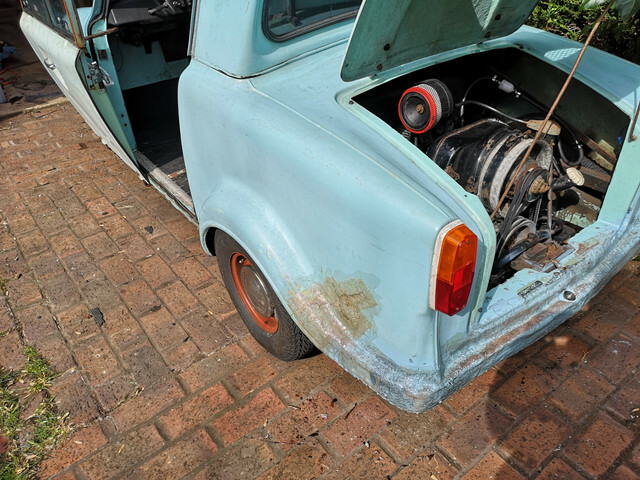 My plan for the Invacar tomorrow (if time permits) will be to pull both CVT pulleys off and to give them as good a clean up as my resources allow. I can still get in, just checked, but there are no new posts that I can see. If you get the "Site is not secure" page, click details, at the bottom of the details page, click " go to website" it says this is not recommended, but This could be that an update of your computer caused this. I get the same page on one of my older computers for the MOM Site. I use Edge for a browser, and under details there has been no way to continue to website. Now there is, and I had to log into the page again. So now it remains to be seen what happens next. Looks like my post (Test, test) is the newest thing there when I got in the same way, using Chrome back in March. So remains be see4n if I can get any responses from anyone else. Thanks for the clue. I swear, and posted here, that Edge did not have a "continue to webpage" option before. I don't get anything like that, Dragon Fan. All I get is " The webpage at https://san-andreas.org.uk/phpBB3/ might be temporarily down or it may have moved permanently to a new web address"
Came home yesterday and found this behemoth on my doorstep. I missed its big brother, the road-eating dragon, it must have arrived after I left for my meeting. Incidentally, at least two of the supporting crew are women, one carrying a clipboard and another driving a road-roller. I had to do a google search for the site using Edge because I don't have any bookmarks on Edge yet. I got right in this time using Edge. Still can't get in using Chrome. This may help, in the Url, After the " phpBB3/" add a "index.php" Without the quotation marks, so you have this, https://san-andreas.org.uk/phpBB3/index.php. If it works you will need to bookmark this and remove/delete your old bookmark. Allen, try and updating your bookmark also, do as R'zil has in his post. do a google search for "Anne McCaffery the new kitchen table" see if that link lets you in. I have no idea about Chrome, never did like it so never use it. My wife & I are like you about Chrome, but we have it primarily for Shutterfly. You simply can hardly use Edge on it. It takes forever to upload photos with Chrome; Edge will time out. If you find you're having trouble with Facebook on Edge, try Chrome there. That's another site tuned for Chrome. YouTube too, especially if you want to upload vids. Well, so far eliminating my old bookmark for the NKT and making a fresh one off the page when I got in is working. So anybody & everybody who's not been able to get in like me, do like R'zil and Dragon Fan say and come on over. I need help clearing the dust & cobwebs. Let's get the place going again. I didn't forget the photo, it just didn't post. I think I left out a step in the process. I'll try again when I've had a chance to see if I got a decent picture of "big brother" which was outside my window all day Monday.